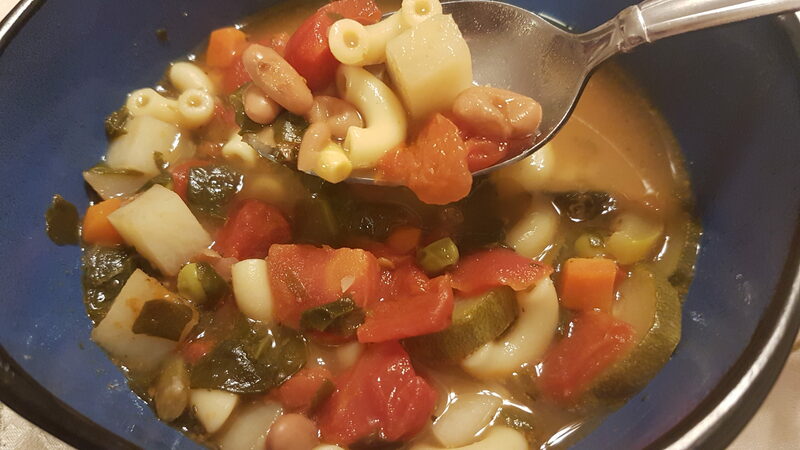 Dinner – Minestrone Soup. 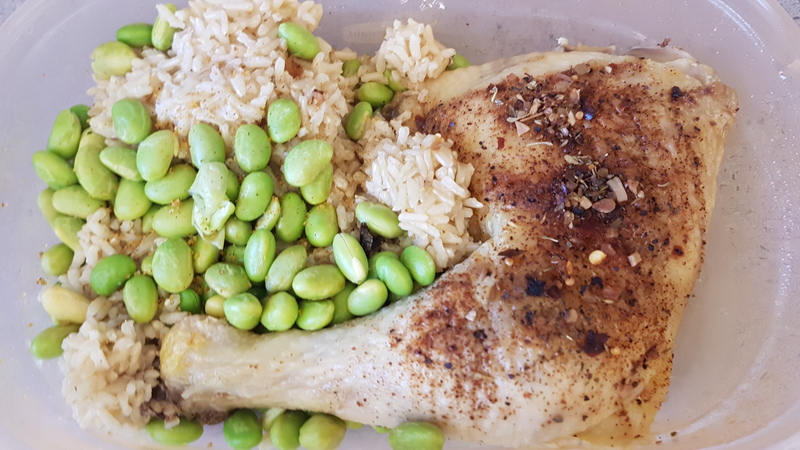 I had this bag in the freezer from my batch freezer meal prep session a long time ago. I defrosted it overnight, and then tonight just put it in a pot with the broth from the rib bones last week until boiling. I was a little worried that the noodles would be mushy and gross from being frozen and then thawed, but it actually turned out to be the perfect consistency. 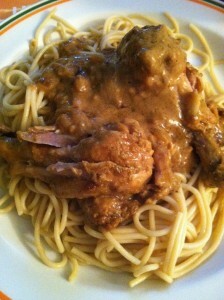 This was a really tasty batch, I would use this recipe again. 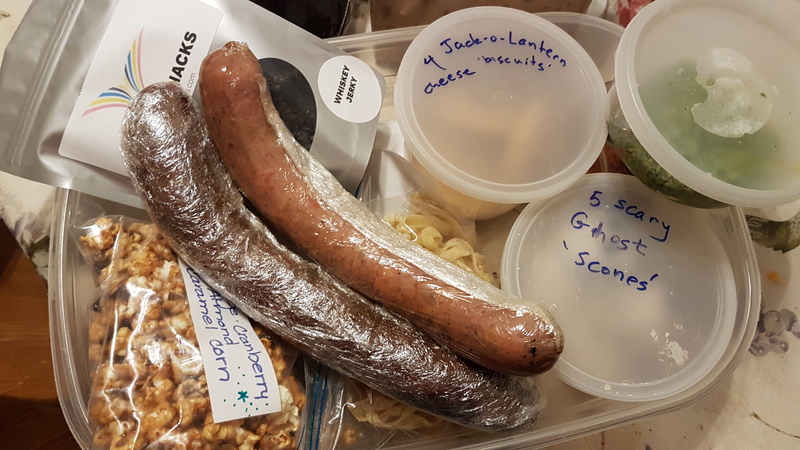 I had brought several items for trade, including some marigold seeds from my yard, hickory nuts (we have 3 trees, and more nuts than we know what to do with) and some homemade garlic rosemary bread. The bread was a hit, as baked goods usually are. 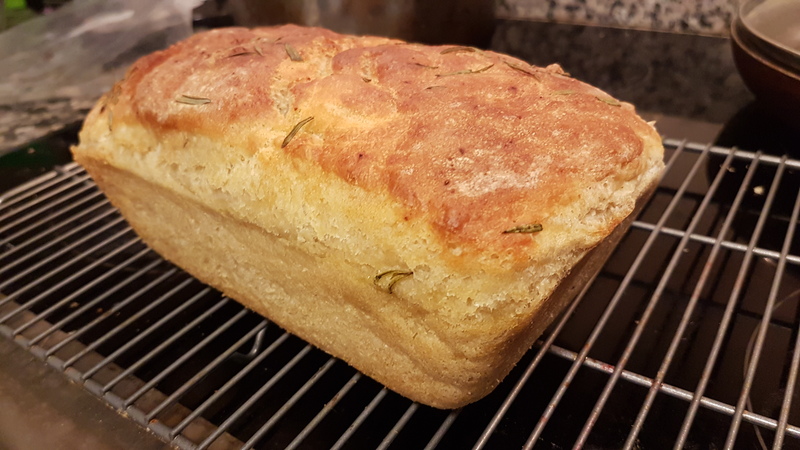 I think I found my niche, as you can trade for really good items with homemade bread. I got lots of caramel corn, jerky, baked goods, fresh pasta, and some pesto. Luckily, pesto was already on the menu for tomorrow! 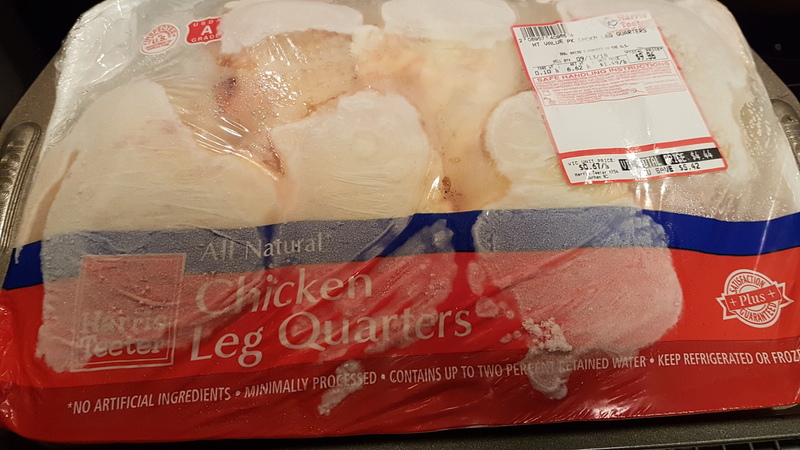 I had also taken out a giant pack of chicken quarters I got on crazy clearance a few weeks ago. It was $4.44 for 6 leg quarters! That is a lot of chicken for less than a buck a piece. 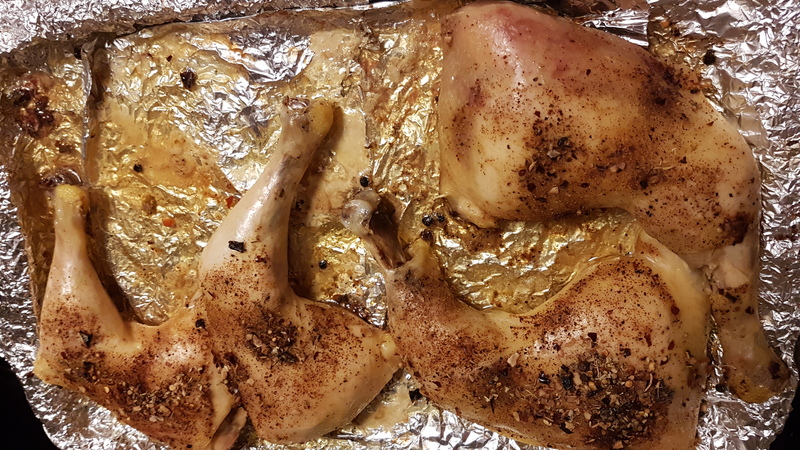 I roasted them up on a sheet pan to keep in the fridge for the boy to snack on whenever he’s hungry this week. 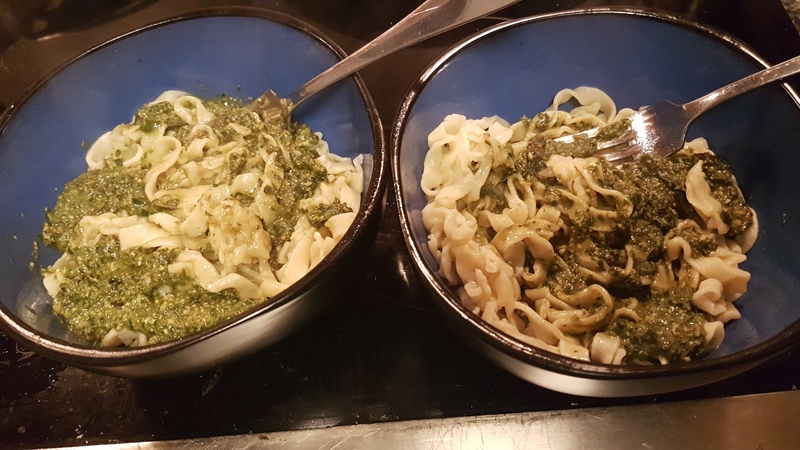 Dinner – Pesto pasta, using up the fresh pasta from the Food Swap and the rest of some frozen blender pesto I’d made when the basil was done for the season. So garlicy and delicious! 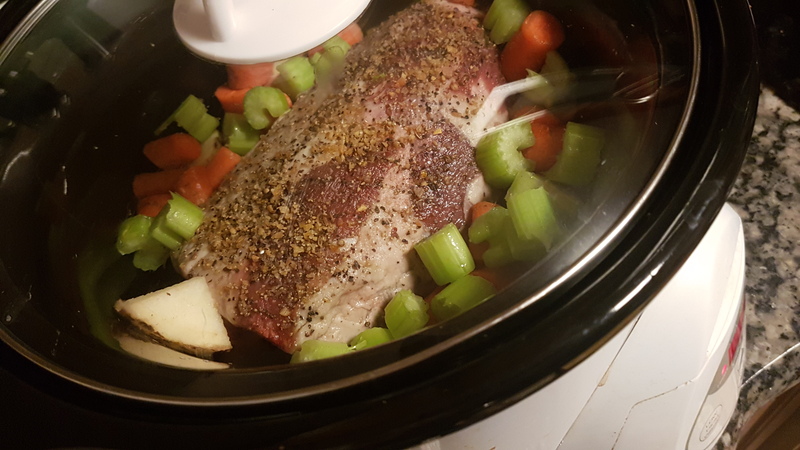 Luckily I have a programmable slow cooker, so I could set it on high for 4 hours, and then it automatically switches to “keep warm” setting so it doesn’t burn. It was a perfect meal for a chilly fall evening. I love that it is just starting to turn kind-of-cold now. 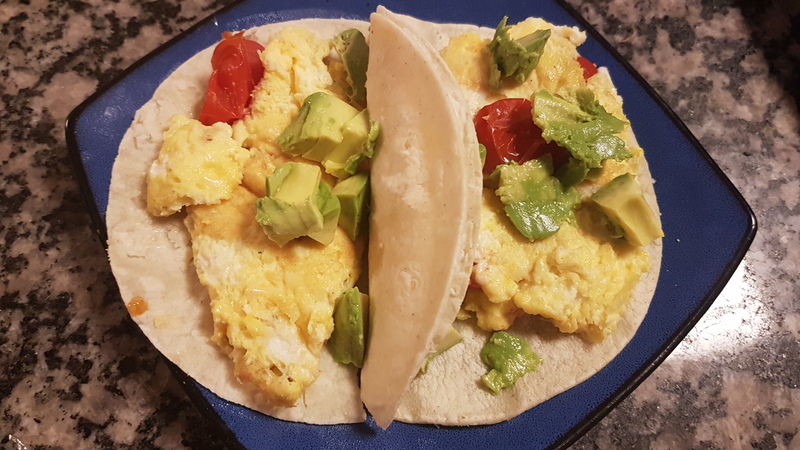 Breakfast – I bought a pack of white corn tortillas with the idea to make quick breakfast burritos this week. They were delicious, but the tortillas fall apart and are way too flaky to eat in a car. Flour tortillas from now on. 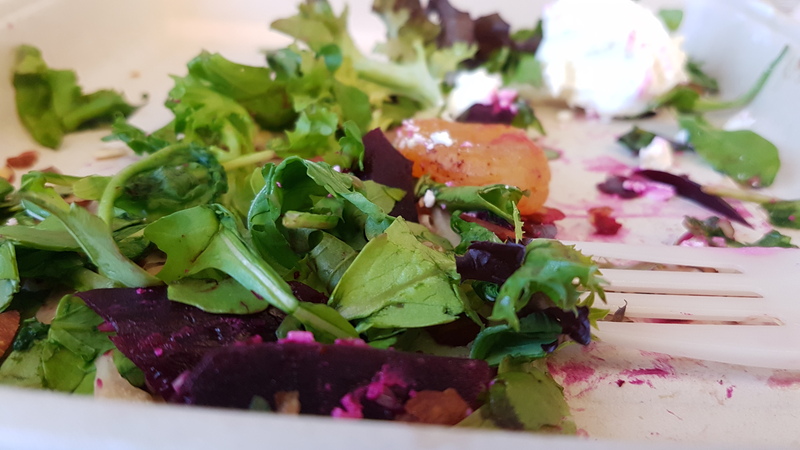 Lunch – Beet and Goat Cheese Salad with a coworker. 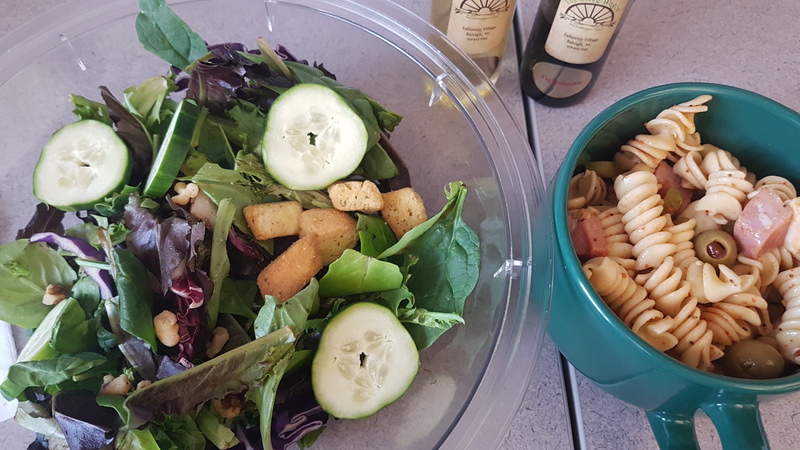 I did spend about $7, but this is my first lunch out all month, and the salad was really delicious. No regrets. 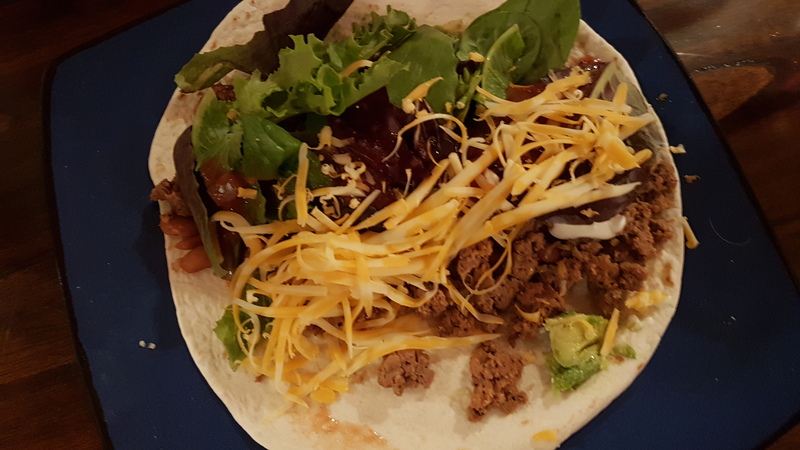 Dinner – Burritos, because there is never a bad day for a burrito. This weekend is pretty exciting, we have a housewarming for a neighbor on Friday and will take a bottle of red wine over to say welcome to the ‘hood. They are about our age, so I’m hoping for a future friendship there. We got invited because I am the only one who has come to say hi since they moved in! It pays to be friendly. And then Sunday will be recovery and chores. Sleeping in, raking leaves, doing dishes and laundry. You know, all the fun adulting things you have to do. But probably a healthy dose of video games thrown in too. 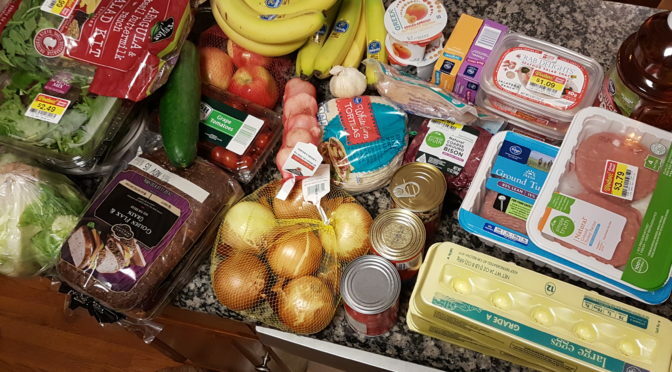 This week I am quite pleased with groceries, especially since I was going for super healthy and lots of produce. Most people see winter as the time to gain a little “insulation”, but since we have plans for the holidays which may involve a swimsuit, I’m actually cracking down on my diet, meaning even more produce than normal, and hopefully lower volumes of carbs and dairy. We will see how the next few months go. I did find some great deals, for example grass fed free range bison, which is absurdly expensive, was marked down nearly half off. It is still shockingly expensive to me, but we do love the flavor and so since I was far within my budget I picked it up to have as a treat at some point. 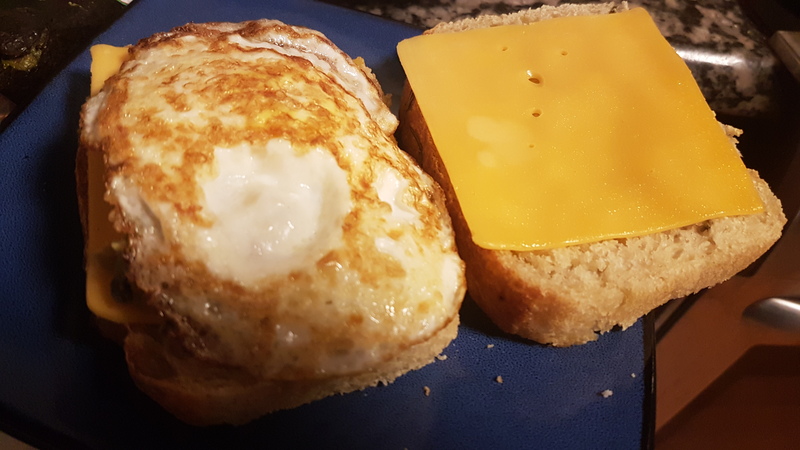 Eggs were on super sale, at 79 cents per dozen, so that will likely be my go-to snack this month. 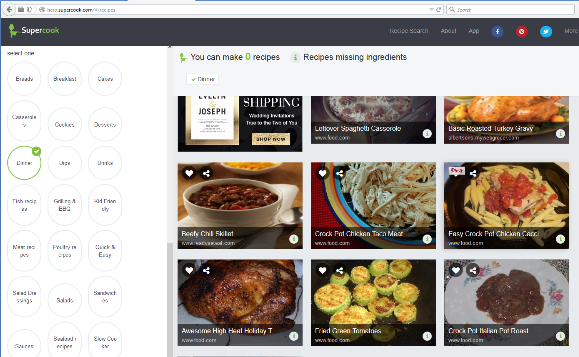 And I found marked down crab meat for 0.99, so I’m going to try some new recipes. This week really reinforced the benefits to eating leftovers. Every dollar spent on food is a sunk cost, so not eating leftovers and throwing away food is like throwing dollars in your trash can. 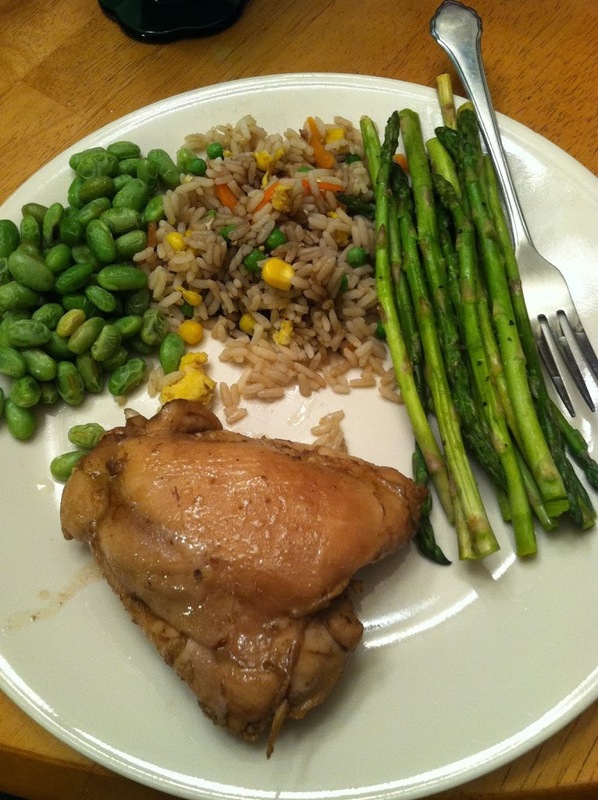 I’m so glad hubs and I both don’t mind, and in some cases prefer, leftovers. 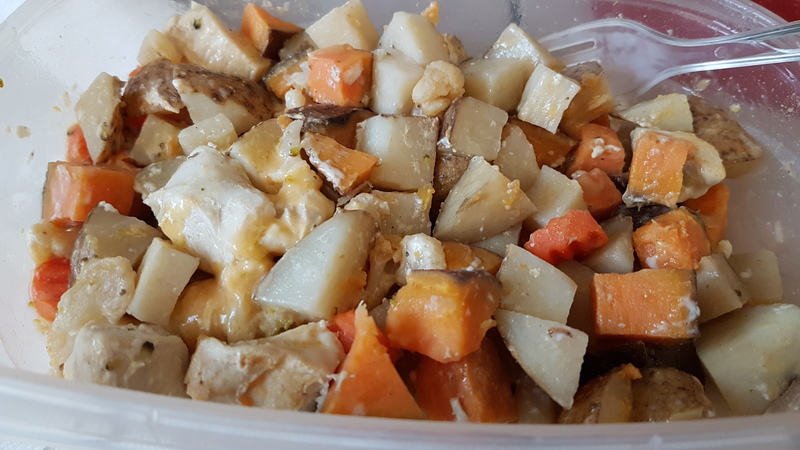 I even plan many meals to make more than we can eat in one day, so that we have easily reheatable meals and snacks around. I also am finding that I have way more food than I think we do! 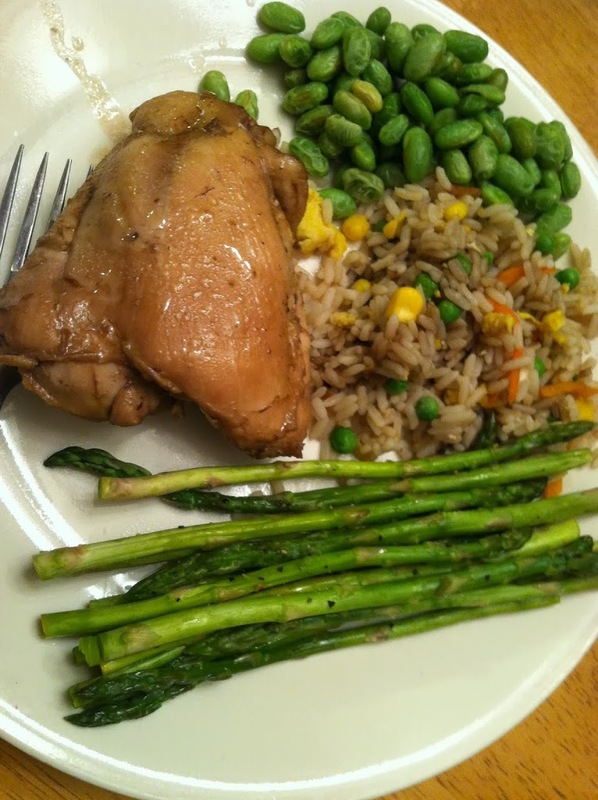 Just pulling most of our meals from the freezer this week, has helped tremendously in keeping overall cost down. And those stocked freezers come from picking up things on sale as I see them, then putting them away for future meals. 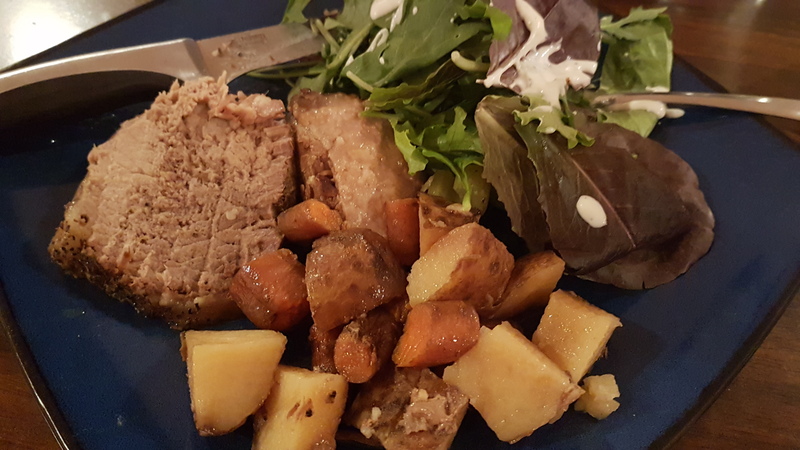 The flexibility of being able to put together a meal from pieces picked up over time is a skill which can be developed by practicing over time. I’d highly encourage it! Do you ever just need a little something to tide you over? 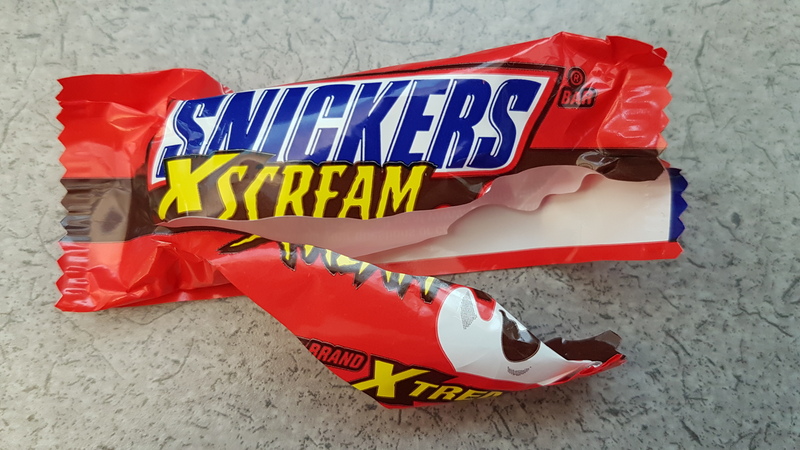 A small bite on the run while your tummy’s growling? Or maybe the kids just ran in from playing and you need something with sustaining energy STAT so they can get back to their fort or sandbox. 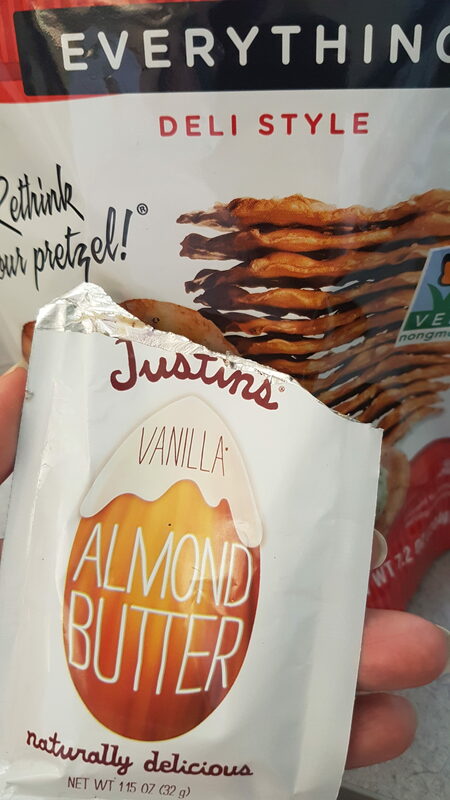 This has been a favorite snack of mine for a long time. It is super easy to pull together, taking maybe 30 seconds depending on how tightly and neatly you want to roll this. 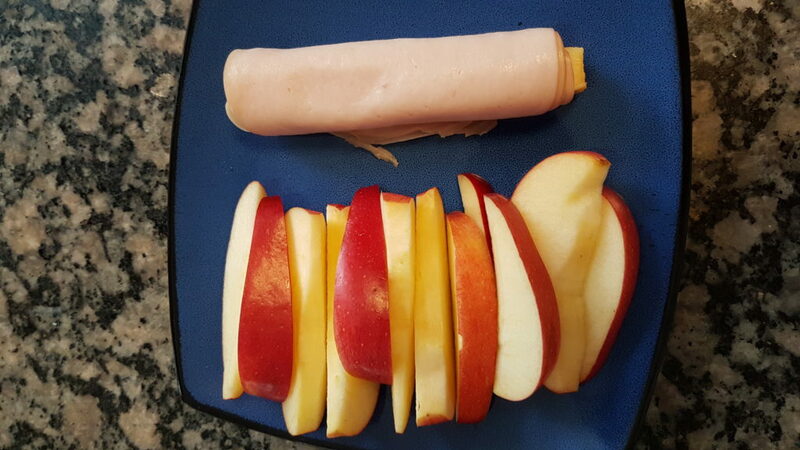 You can use whatever type of lunch meat and cheese is available too, don’t limit yourself to just turkey and colby. You could also make several, cut into bite sized pieces, and spear with toothpicks for an effortless hor d’ourve everyone will love! 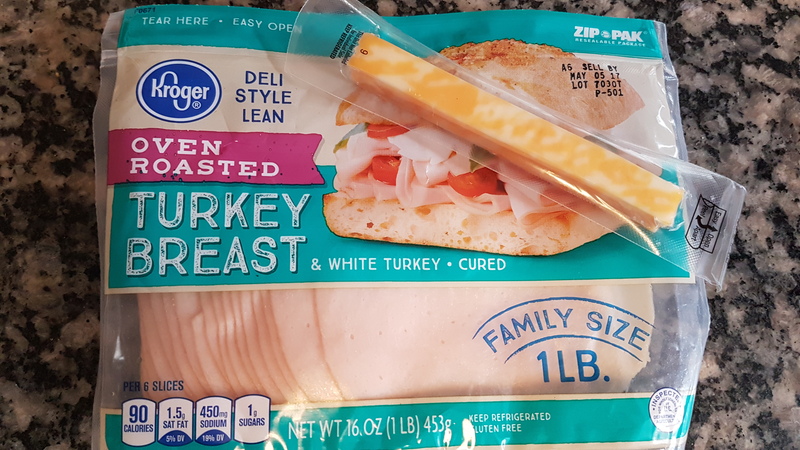 I had turkey breast, and colby cheese sticks. 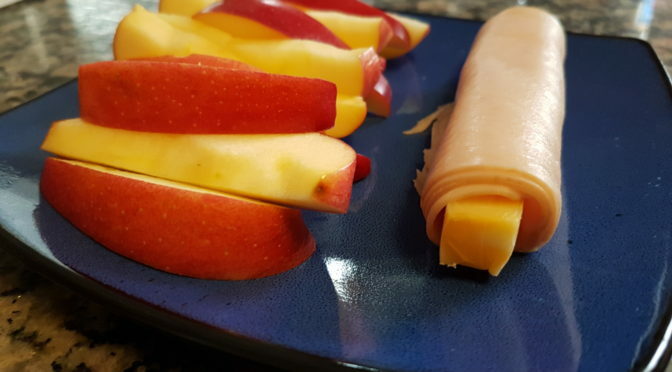 You can definitely use slices of both too, or sliced cheese and chunks of deli meat. It would be a good use for leftover Thanksgiving turkey, Easter ham, or whole cooked and shredded chicken. 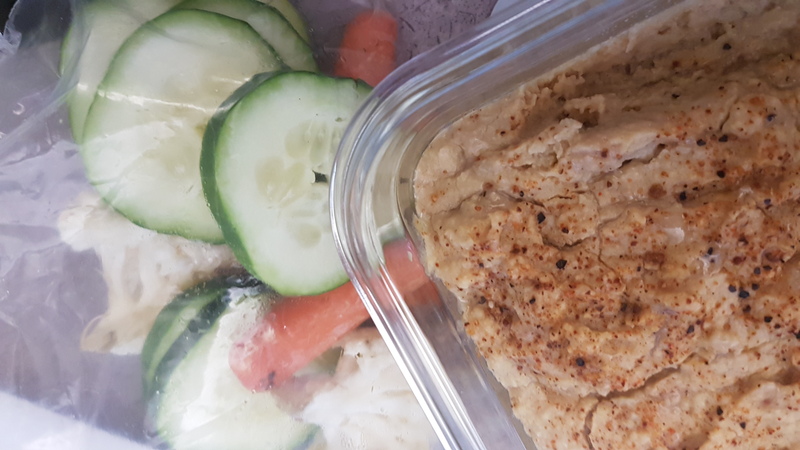 This snack has tons of protein to get you through to your next meal, pair with fruit for a well-rounded nosh. 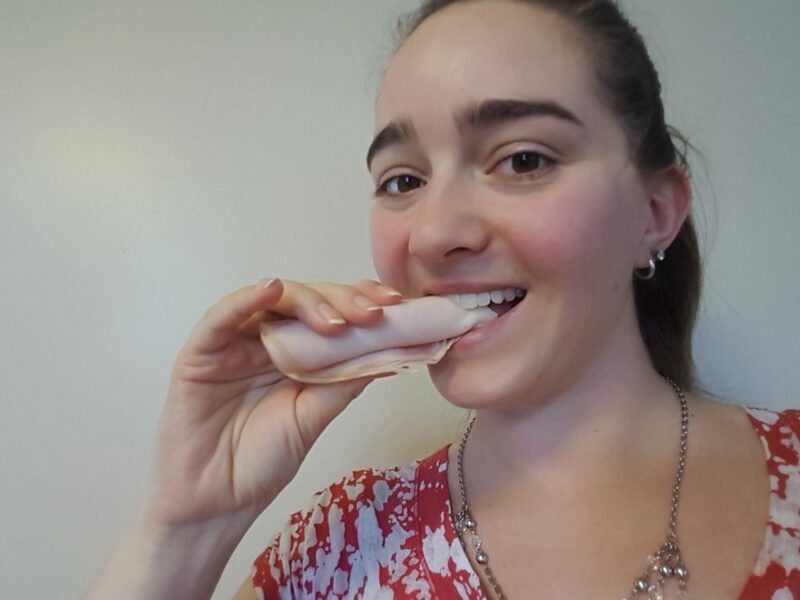 2-3 slices of turkey, ham, roast beef, etc. Step 1: Lay down the meat, add the cheese towards one edge. Wrap the cheese in the meat, rolling the other edge under. 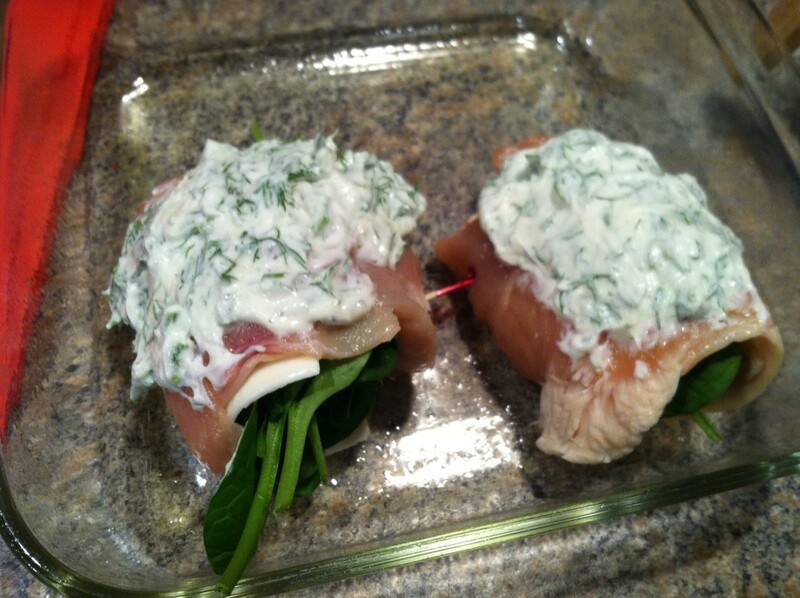 Serve with cut up fruit or raw veggies and dip! You know my biggest topics I love to talk about are: 1) Healthy food, 2) Delicious & New foods, and 3) Affordable food, right? Well, if you didn’t you do now. 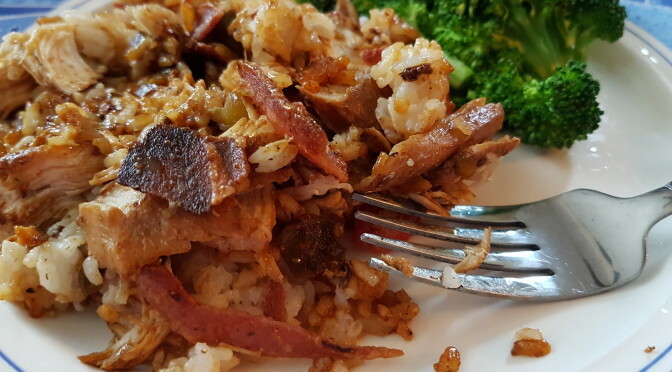 Not much lights me up more than finding or creating a recipe that is good for you, quick and easy to make, and also draws rave reviews from a somewhat finicky eater. 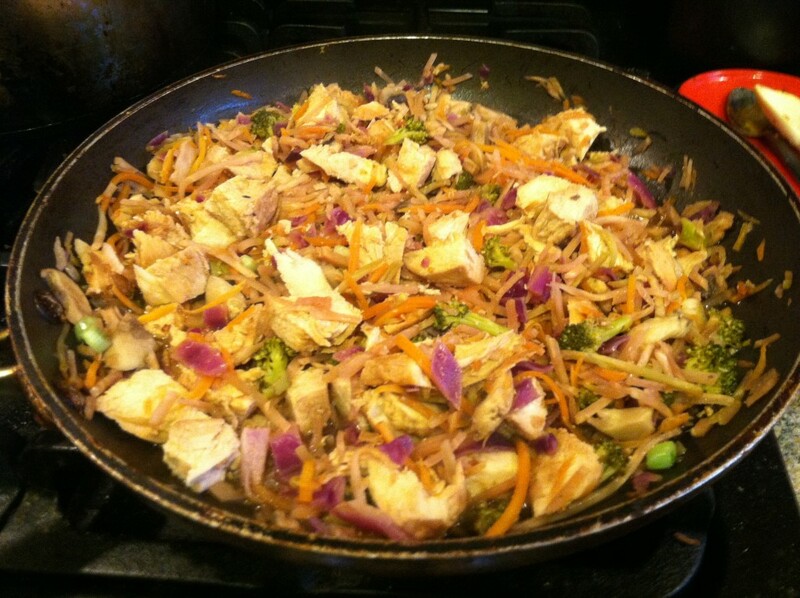 Stir fry is almost always one of those meals. 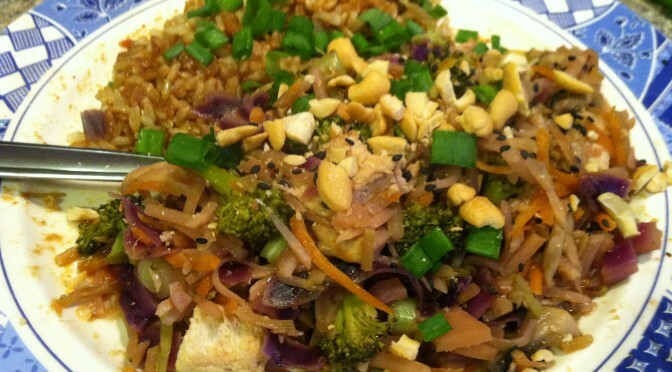 Stir fry is always in my top ten for one simple reason: you can put just about anything in it. Seriously. Chicken, beef, pork, shrimp, scrambled eggs, fish, tofu, tempeh. Broccoli, cabbage, mushrooms, carrots, zucchini, water chestnuts. 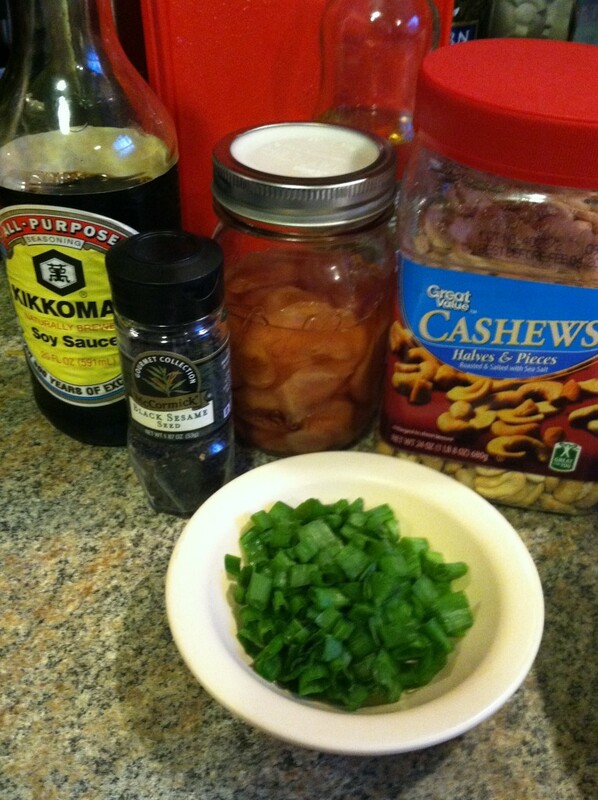 Ginger, soy sauce, fish sauce, vinegar, onions, garlic, nuts. Sure, there are sometimes occasional fails (for the love of god, do not put oregano into your stir fry, just trust me. Also this is proof I’ve loved stir fry at least since 2011, and how far both my cooking and writing have come since then!). 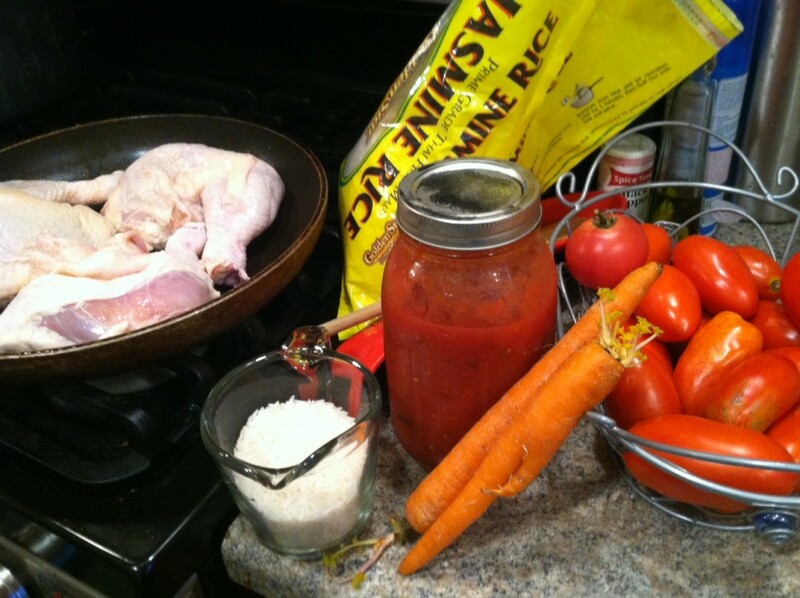 But the majority of the time, the recipe of Protein + Veggie + Rice + Sauce = Magic. For this particular recipe, I had just made a batch of My Homemade Pickled Ginger and it had aged in the refrigerator a week or two, so I was eager to try it out. I also had some black sesame seeds which had been a Christmas gift and I still hadn’t yet used. 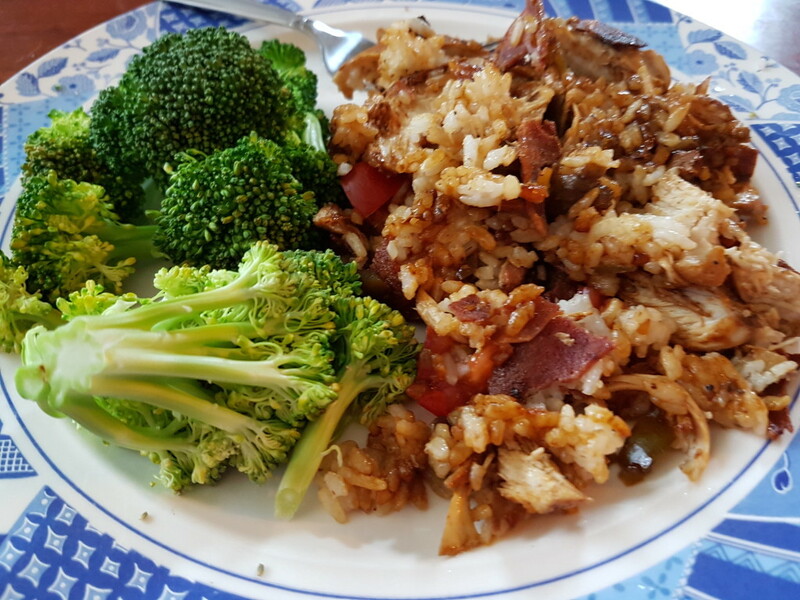 Combine that with a cheap $1 store bagged mix of broccoli slaw, free green onions that grow wild in my yard, a cup of brown rice, and some other ingredients I always have on hand, and I had a super quick, super cheap, and super satisfying dinner. A few notes on substitutions: If you do not like cashews or don’t buy them because of cost, you can easily substitute peanuts or almonds. Or if you’re allergic, definitely omit them! 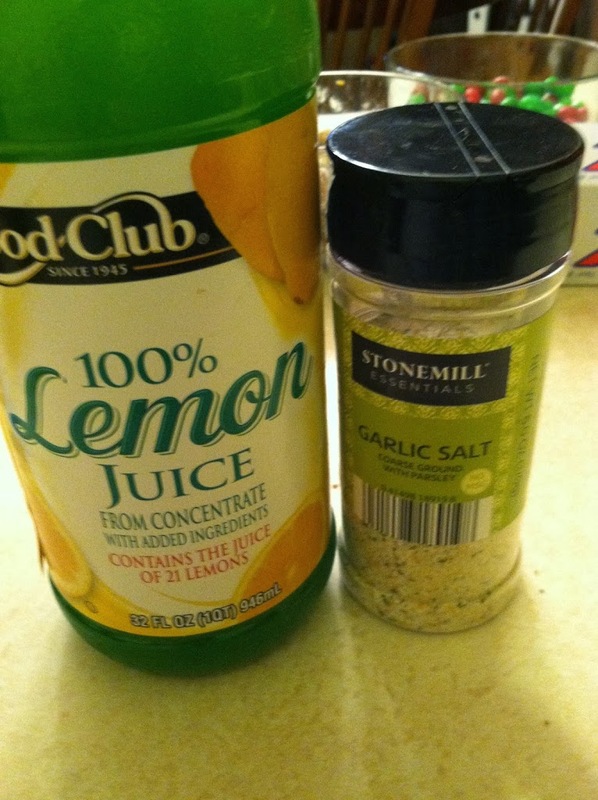 (You could add a sprinkle of nutritional yeast for a boost of vitamins if you like). If you don’t like onions, use chives, or parsley, or just don’t add it in. 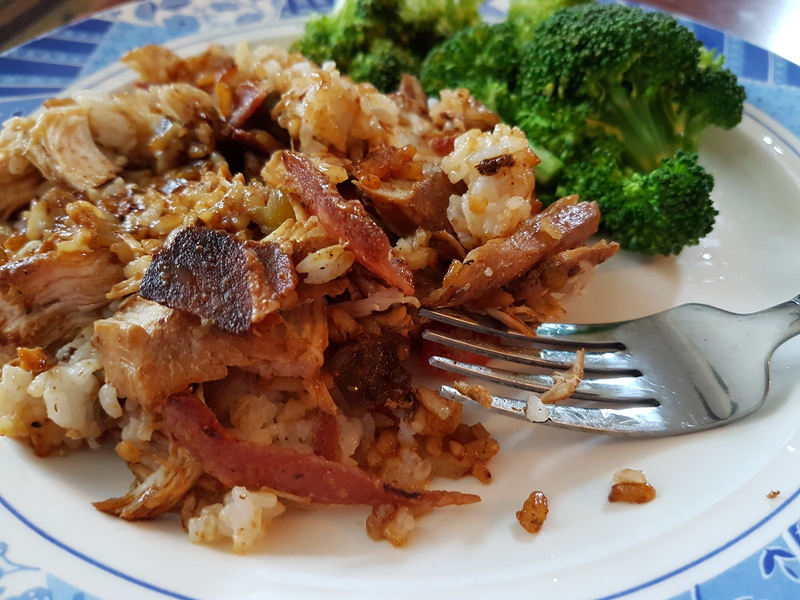 I used brown rice because I like the texture and I like the nutrition as compared to white, but you can totally use white rice, or a 1/2 and 1/2 mixture! 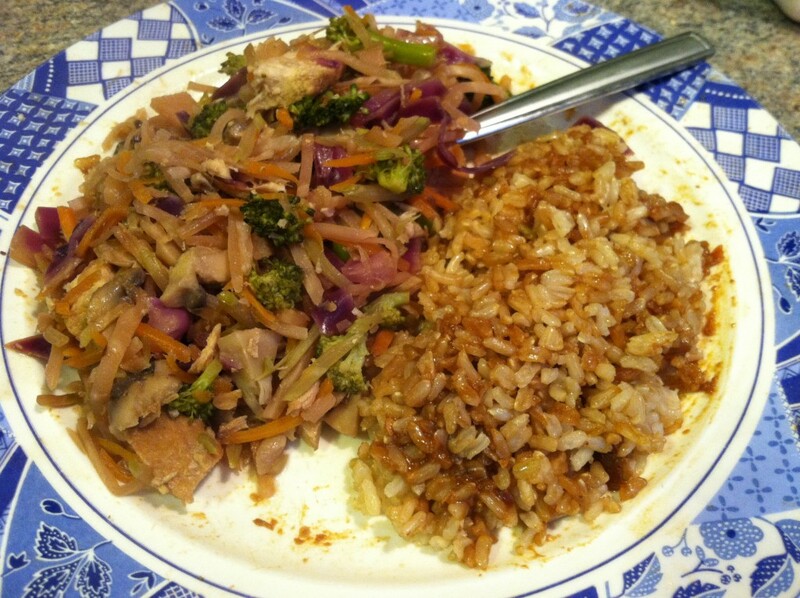 You can use shredded or powdered ginger instead of fresh. And if you don’t like bagged store mixes, feel free to shred your own broccoli, cabbage, and/or carrots. Step 1: Put the bagged slaw mix and mushrooms in a large pan with the olive oil and stock or water and cover. Bring to a boil, and then simmer for 5-7 minutes. Once the veggies are softened, remove the lid and add the soy sauce and ginger. Add in the chicken, mix well to coat, and let the liquid evaporate until most is gone. 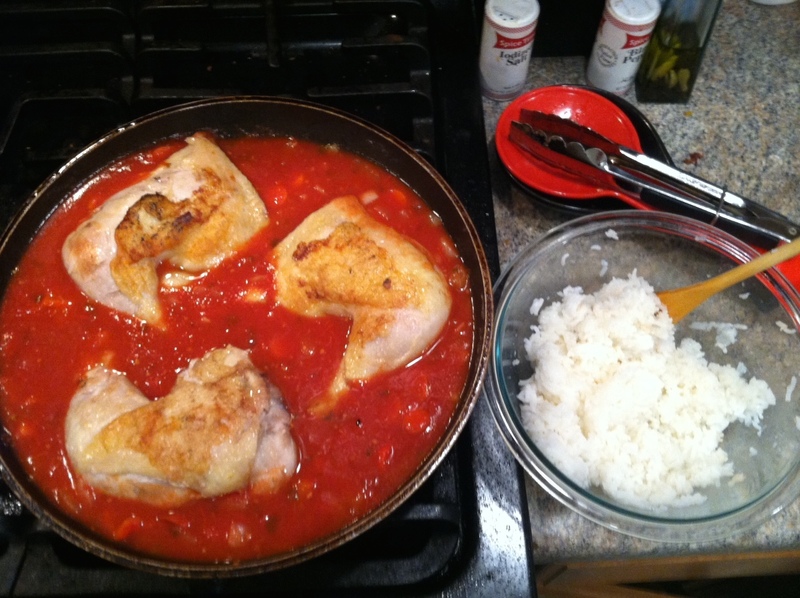 Step 2: Put about 1/2 cup cooked rice and 1/2 the cooked mixture on a place in whatever way visually pleases you. 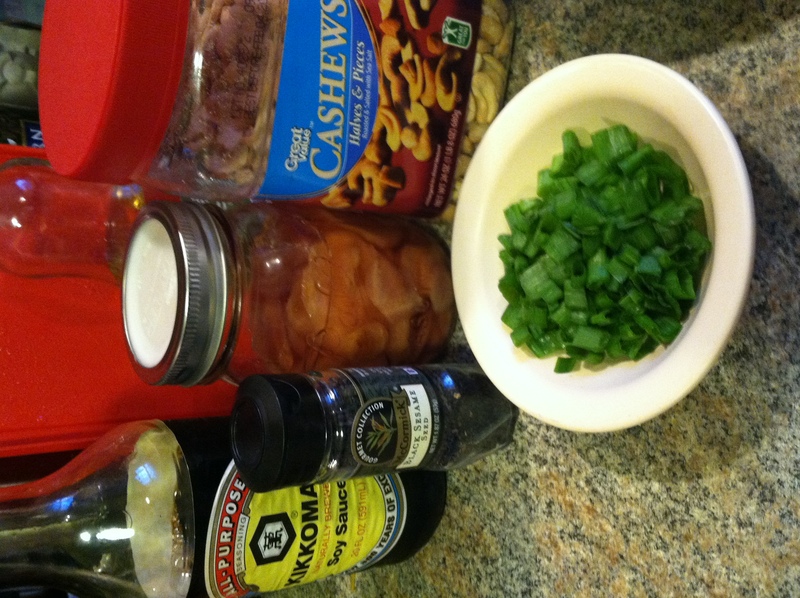 Step 3: Sprinkle the crushed cashews and green onions on top. 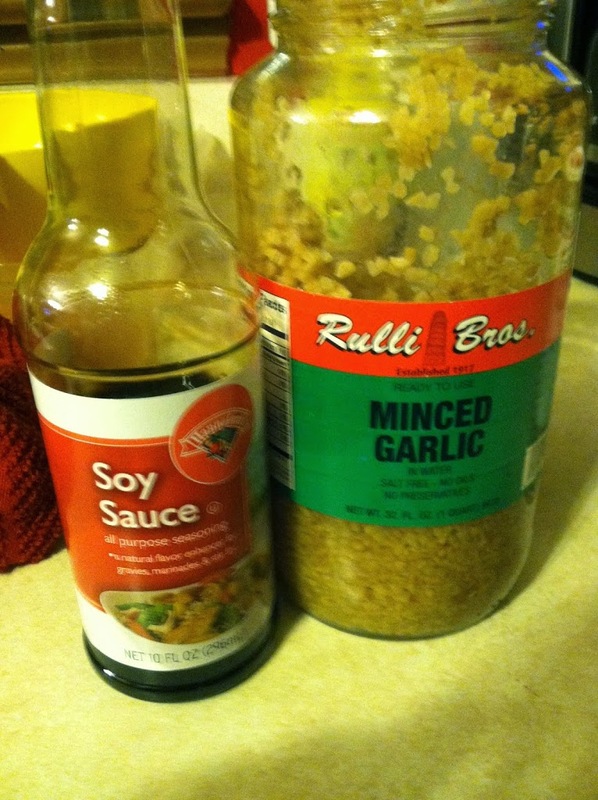 Add a sprinkle of sesame seeds, and enjoy! Ever get really tired of a certain kind of lunch? Like say you always take a roast beef sandwich with cheddar and mustard. Or a tuna salad pita pocket. Or a certain type or brand of soup. When you eat the same thing several days in a row, you can get bored easily. 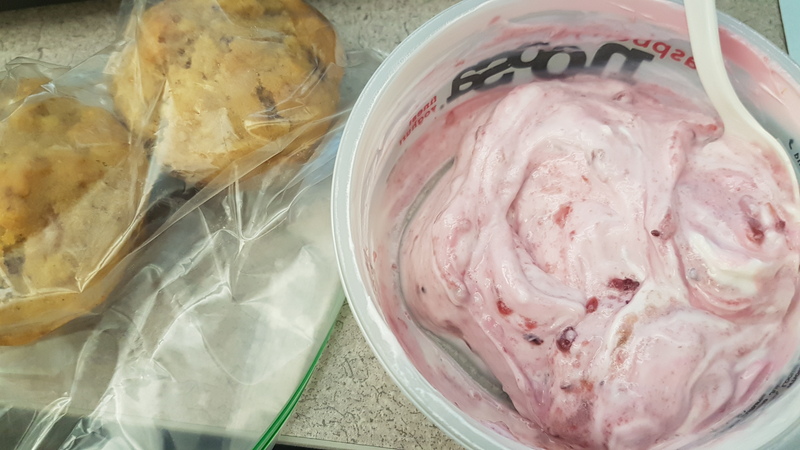 But then you also want more ‘grown-up’ options sometimes than just peanut butter and jelly, or maybe you don’t have any leftovers to choose from at the moment. 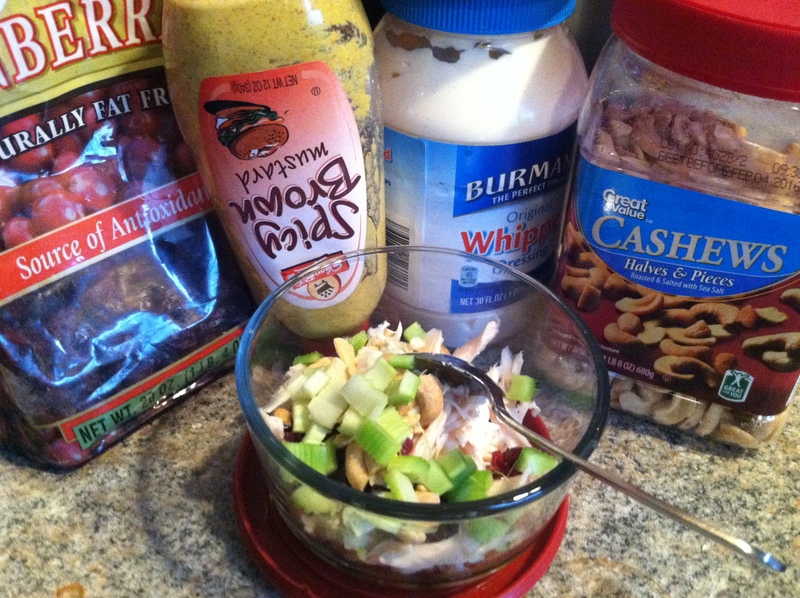 This is a super simple recipe for a great tasting and healthy chicken salad sandwich mix. 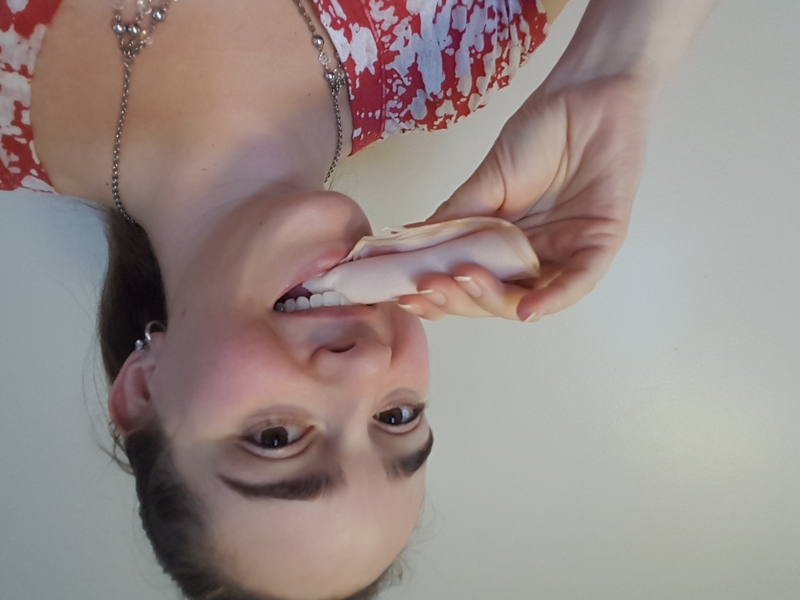 It is designed to make just enough for one large sandwich or wrap, but you can easily increase the quantities to feed a family of four or a luncheon buffet for fifty. It has a tiny bit of sweetness, which helps kids love it too, and a nice bit of crunch to make it interesting. 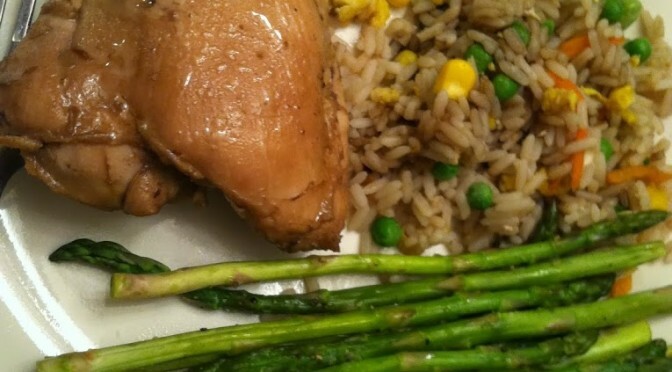 No one needs to know that you snuck in an extra serving of fruits & veggies. For maximum healthy, use plain Greek yogurt to bind it, and serve as a lettuce wrap or on whole grain bread or tortilla with extra veggie toppings. 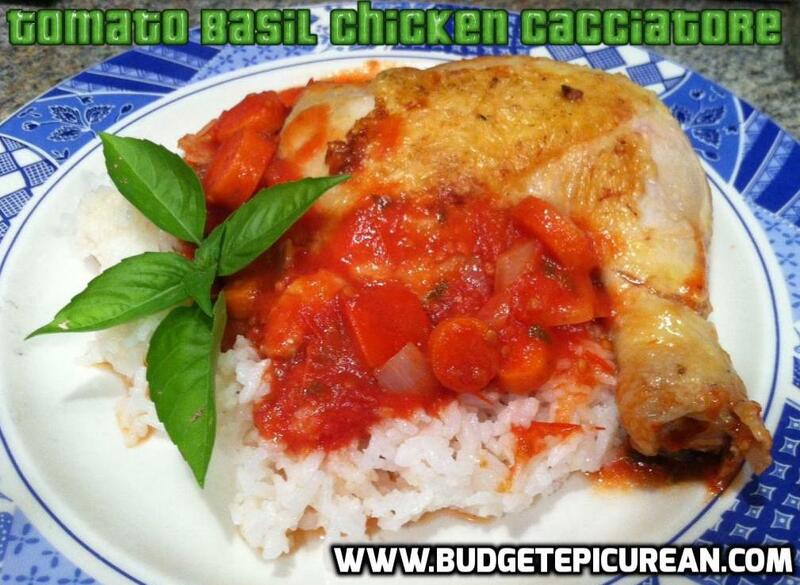 This is a great way to use up extra chicken meat from a whole bird, and is very frugal and versatile. Try this the next time you need lunchtime inspiration, a quick after-school snack, or a buzz-worthy picnic dish. 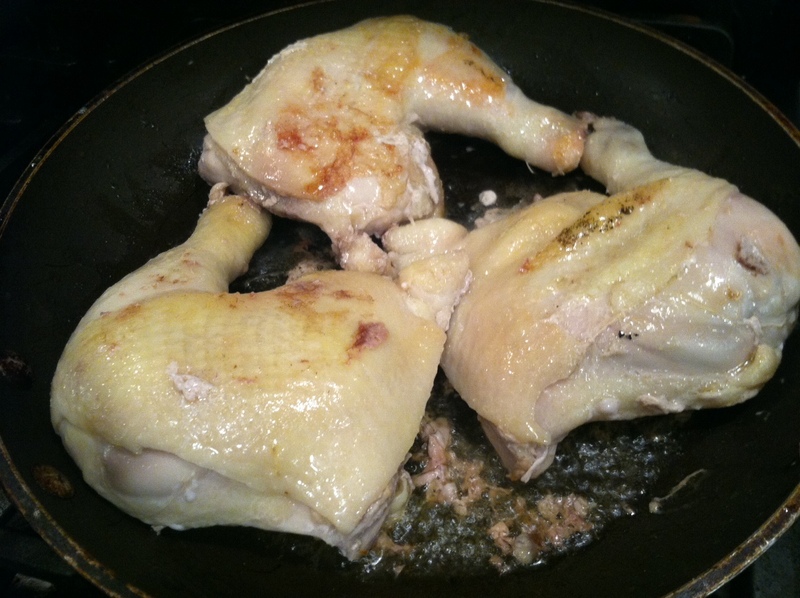 Step 1: Use meat from a cooked chicken (such as rotisserie) to save time, or poach 1 boneless skinless chicken breast in water or broth until no longer pink. Shred with two forks, and use about 1/2 cup per serving you intend to make. 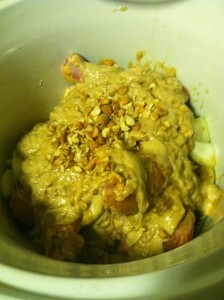 Step 2: In a bowl, mix all ingredients together well. 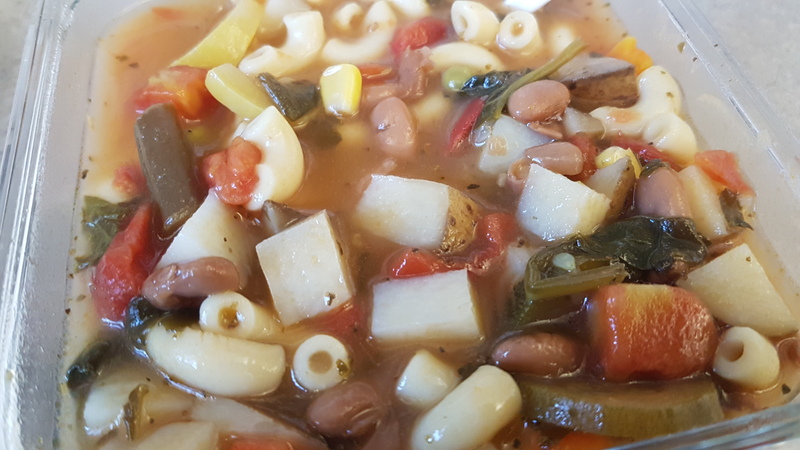 This tastes even better if you let it sit overnight in the refrigerator, and will keep up to a week. 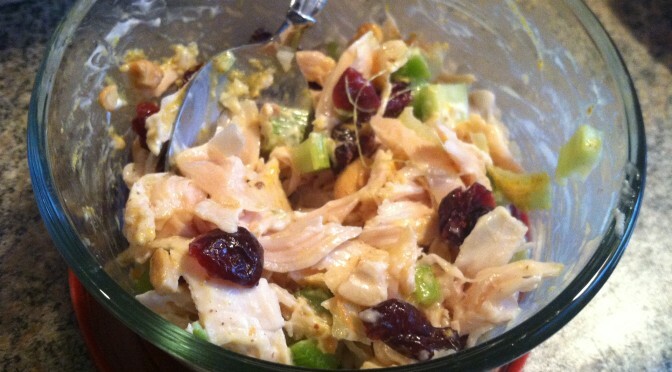 Feel free to add in your own flavorings like lemon or lime juice, use raisins instead of cranberries, or add spinach rather than celery. 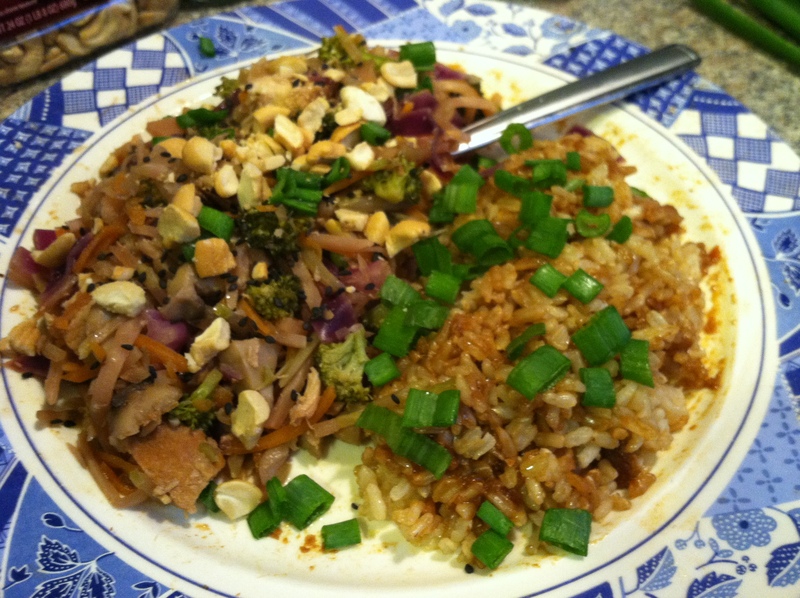 If you have nut allergies, omit the cashews/peanuts, and if you still want crunch add a tbsp large breadcrumbs, fried onions, or Chinese noodles. 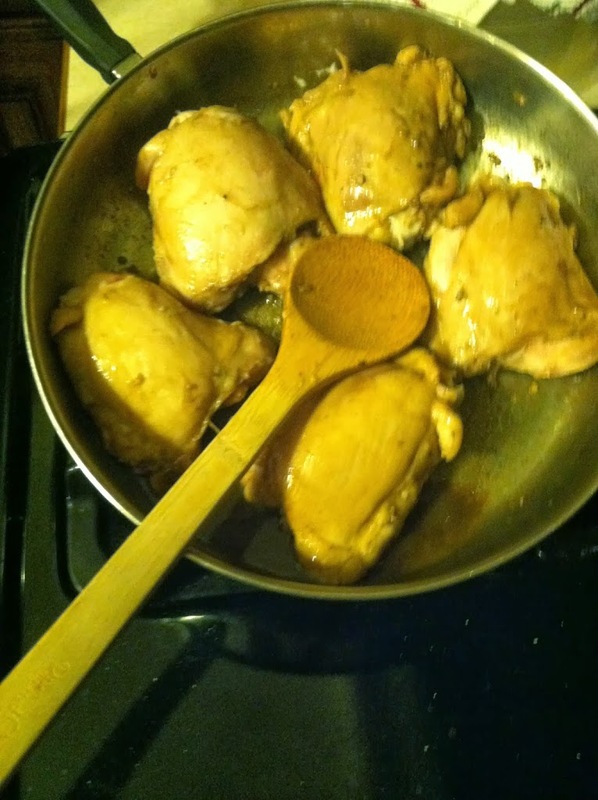 Use meat from a cooked chicken (such as rotisserie) to save time, or poach 1 boneless skinless chicken breast in water or broth until no longer pink. 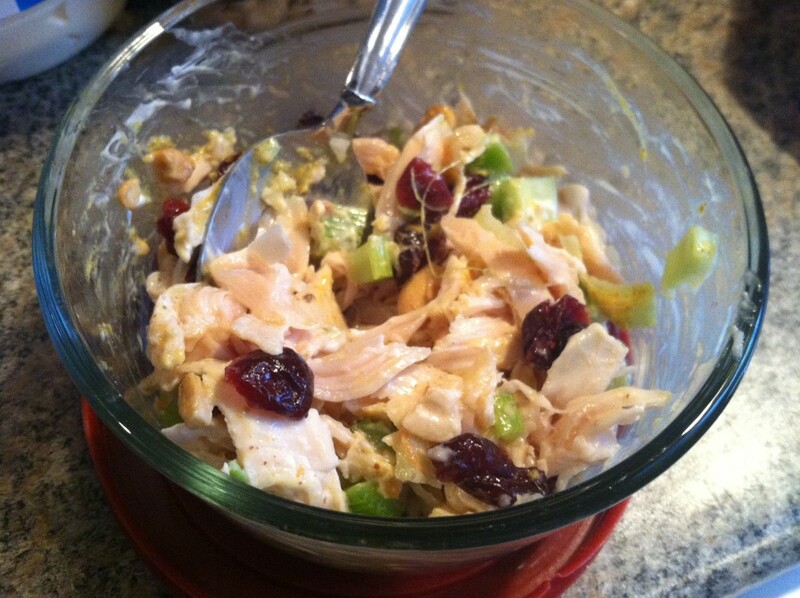 Shred with two forks, and use about 1/2 cup per serving you intend to make. In a bowl, mix all ingredients together well. 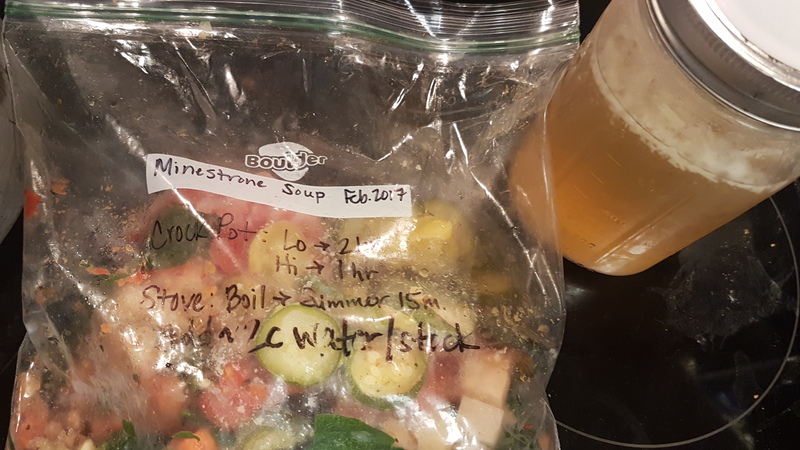 This tastes even better if you let it sit overnight in the refrigerator, and will keep up to a week. 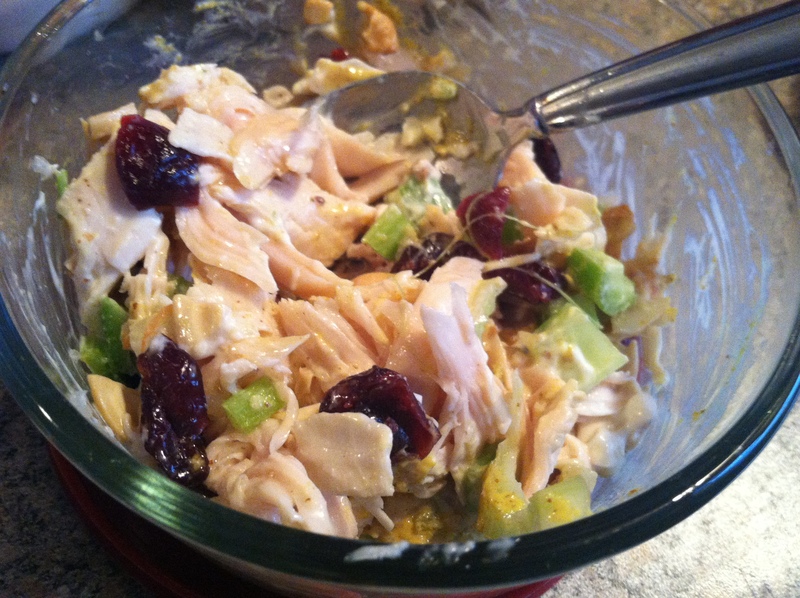 Feel free to add in your own flavorings like lemon or lime juice, use raisins instead of cranberries, or add spinach rather than celery. 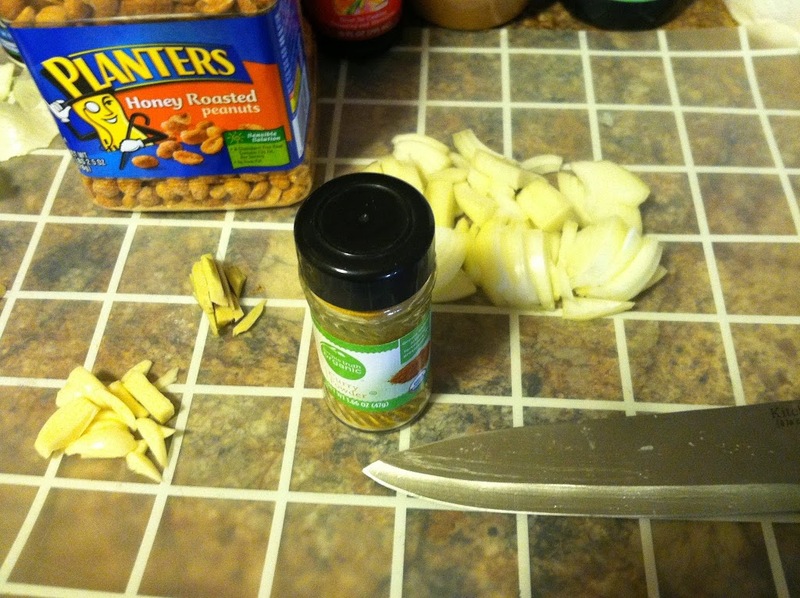 If you have nut allergies, omit the cashews/peanuts, and if you still want crunch add a tbsp large breadcrumbs, fried onions, or Chinese noodles. You know how sometimes you just want to make a meal that looks really nice and impressive, but you don’t want to spend hours in the kitchen? No energy or time for that today. 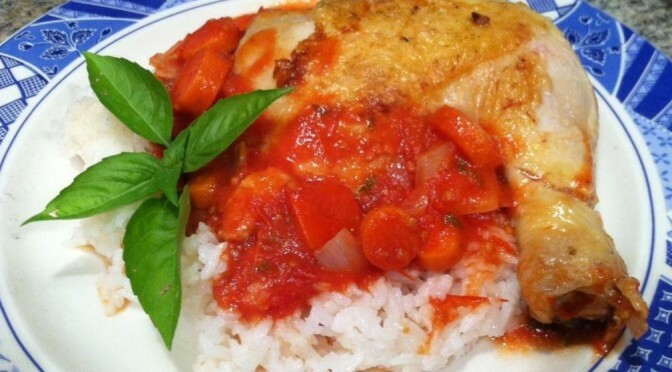 Well, here’s a great recipe that can easily be customized, takes less than 5 ingredients, and in under 30 minutes you have a very nice dinner that other people will think took all day! For these rolls, you can use any thin cut of meat. Try pork chops or a thin flank steak. Even a firm white fish fillet would work. 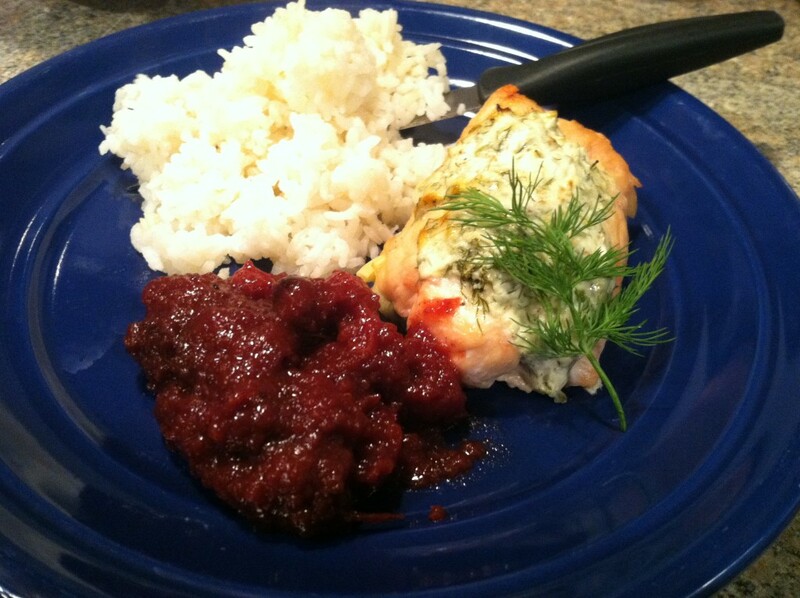 You can then stuff it with any types of vegetables, kraut, stuffing, mashed potatoes, etc. 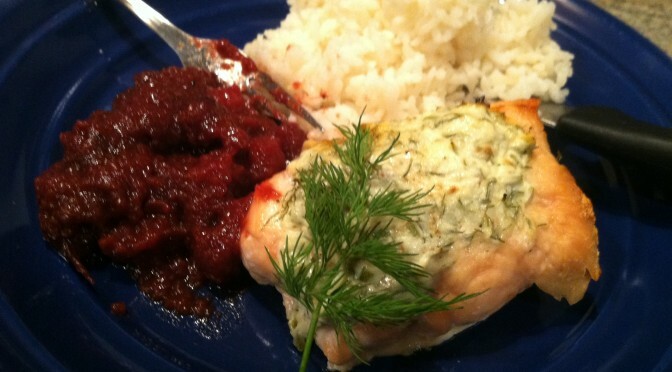 (See my stuffed pork chops for an example). 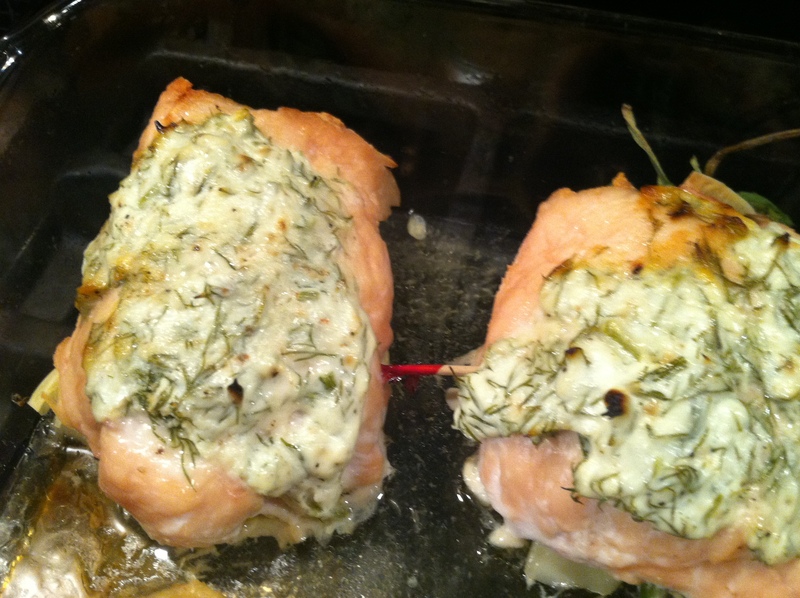 For this particular recipe, I thawed some boneless skinless chicken breasts, and then cut them in half down the center. Then each half I put between two sheets of wax paper, and pounded them thin with a rolling pin. You could use a meat cleaver or heavy glass as well. The thinner they are, the faster they cook and the better able to roll them up they will be. 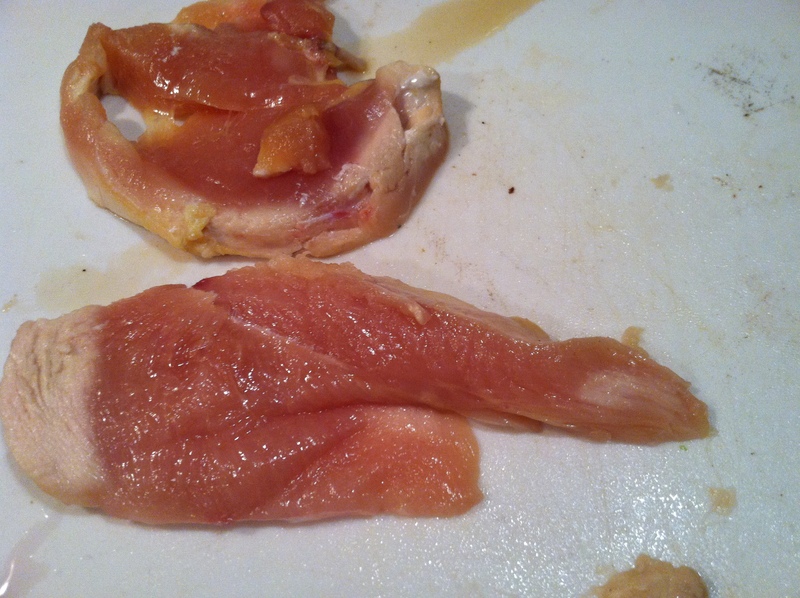 Step 1: Pound the chicken thin, or use very thin cutlets. 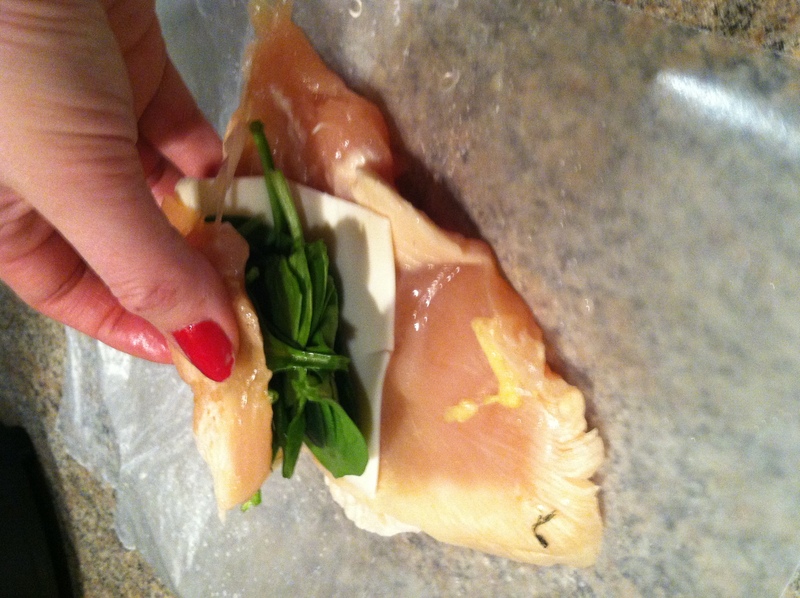 Lay the chicken flat, and layer on the cheese and spinach. 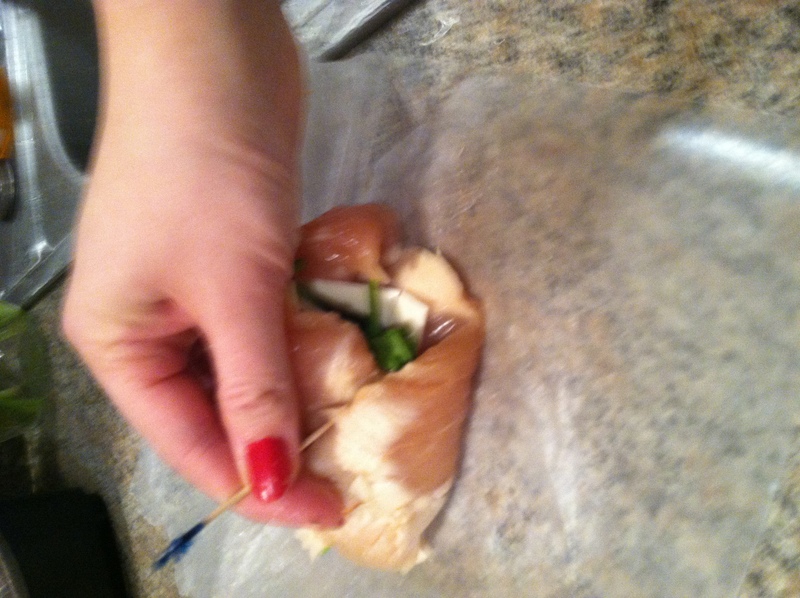 Wrap the chicken around itself into a roll, secure with a toothpick if needed. Step 2: Set the oven to 350, and place the rolls in an oven-proof baking dish sprayed with cooking spray. Optional: top with *yogurt-dill sauce. 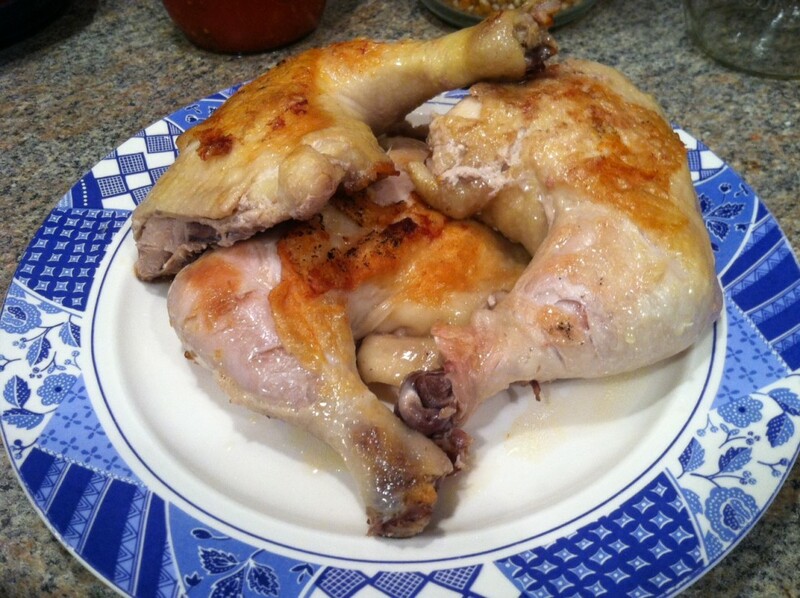 Step 3: Bake for 30-35 minutes, until chicken is fully cooked. 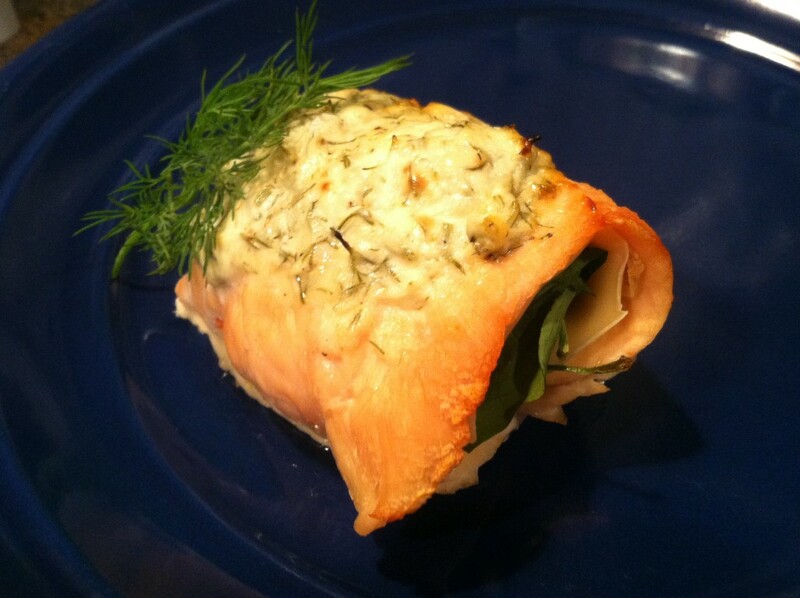 Serve your lovely rolls alone, or with whatever side dishes you like. 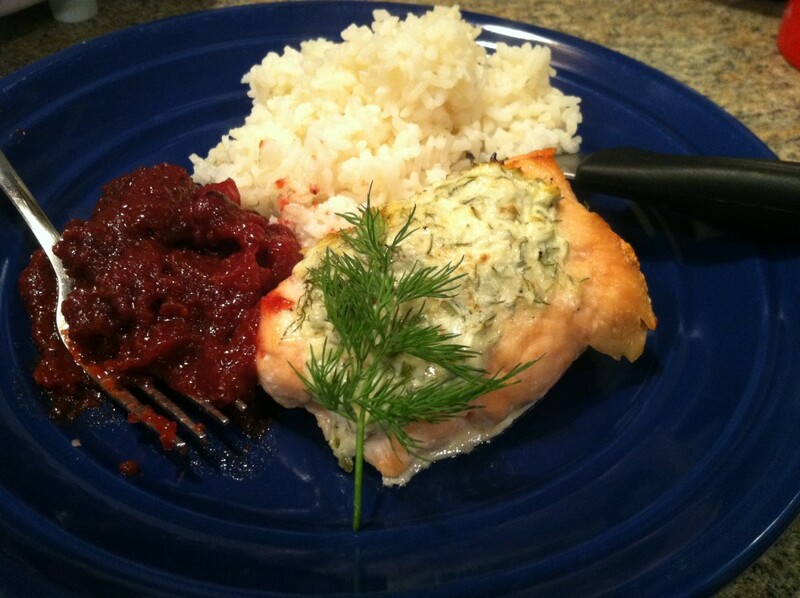 I made some rice and cranberry sauce, and let me tell you, chicken and cranberry sauce is an awesome combo! 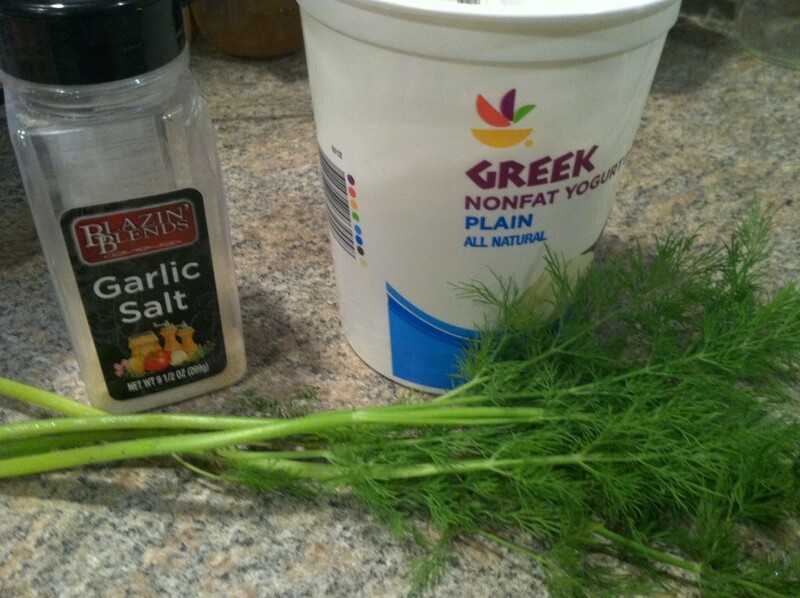 To make the dill sauce, the recipe is below. 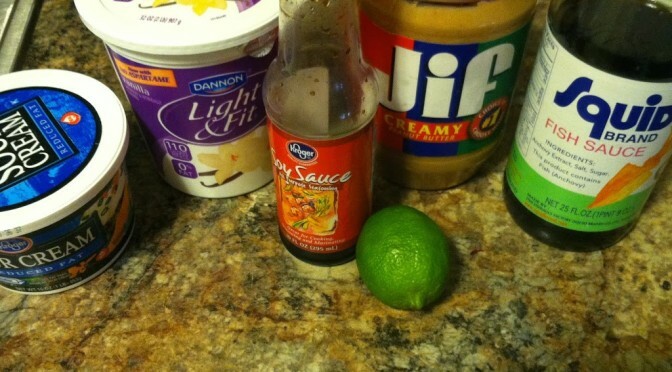 This topping is great because it is so simple, and so versatile. 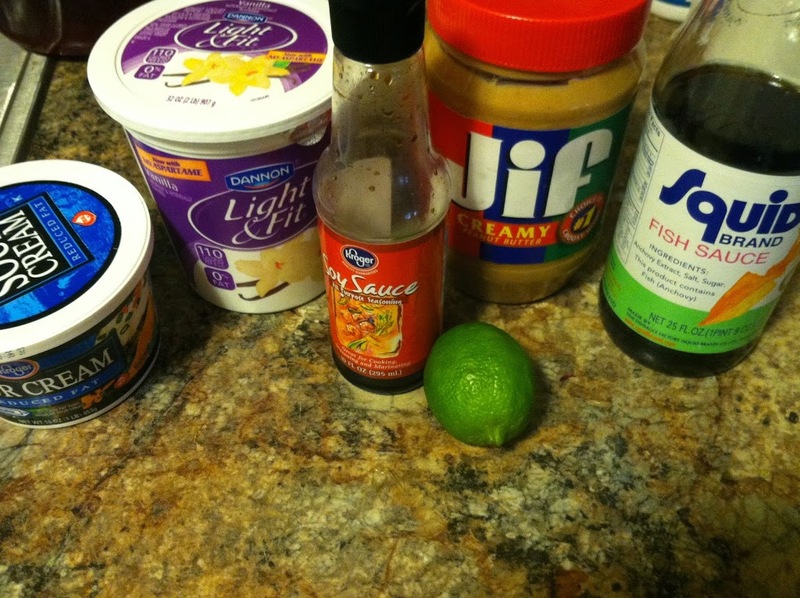 Spread it on sandwiches, add cucumbers to make tea sandwiches, use it on chicken, pork, or fish. Try different herbs too, to change up the flavors. Mix all ingredients in a bowl. Enjoy! 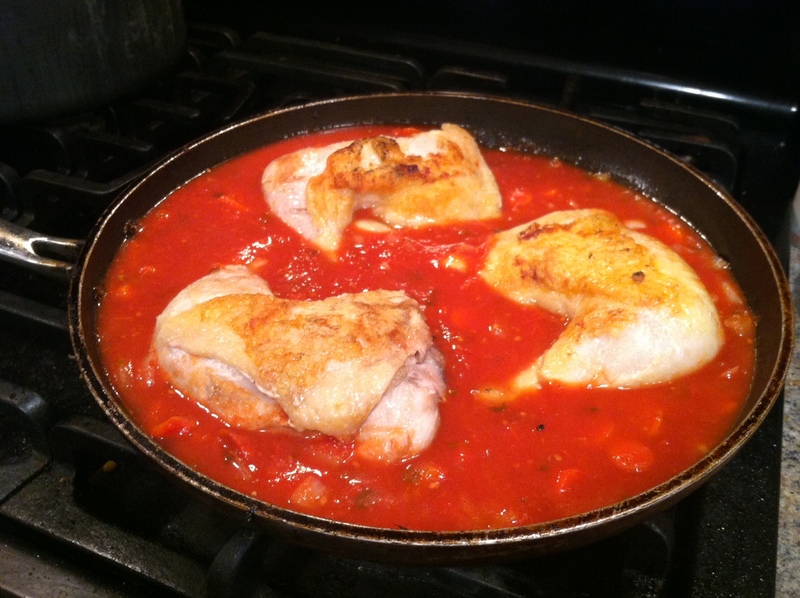 Pound the chicken thin, or use very thin cutlets. 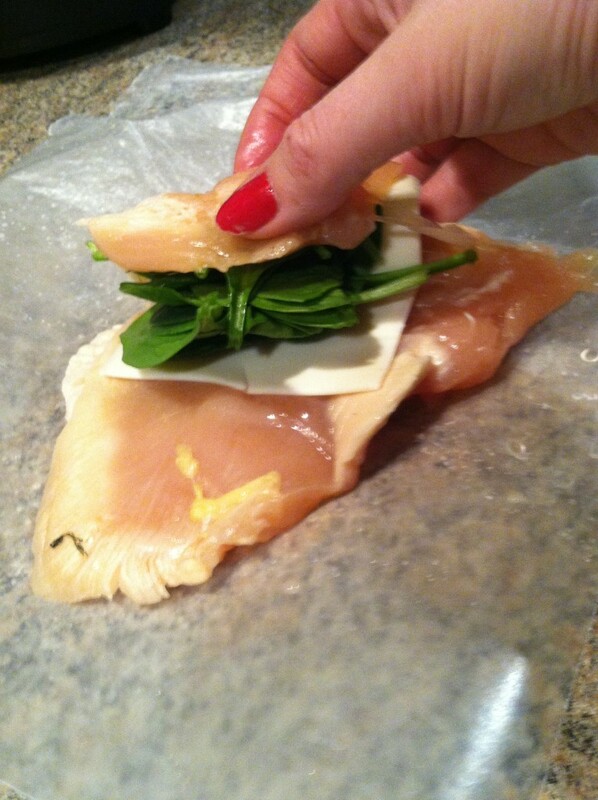 Lay the chicken flat, and layer on the cheese and spinach. 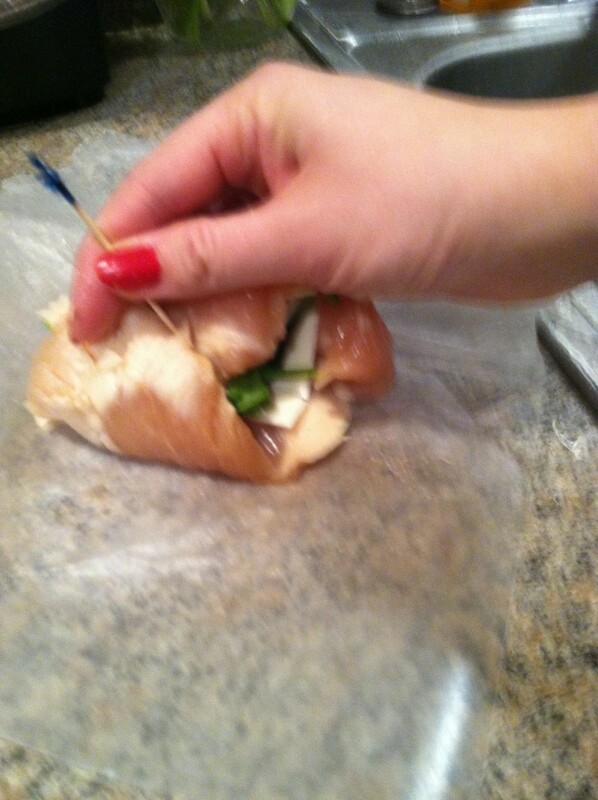 Wrap the chicken around itself into a roll, secure with a toothpick if needed. Set the oven to 350, and place the rolls in an oven-proof baking dish sprayed with cooking spray. Optional: top with *yogurt-dill sauce. 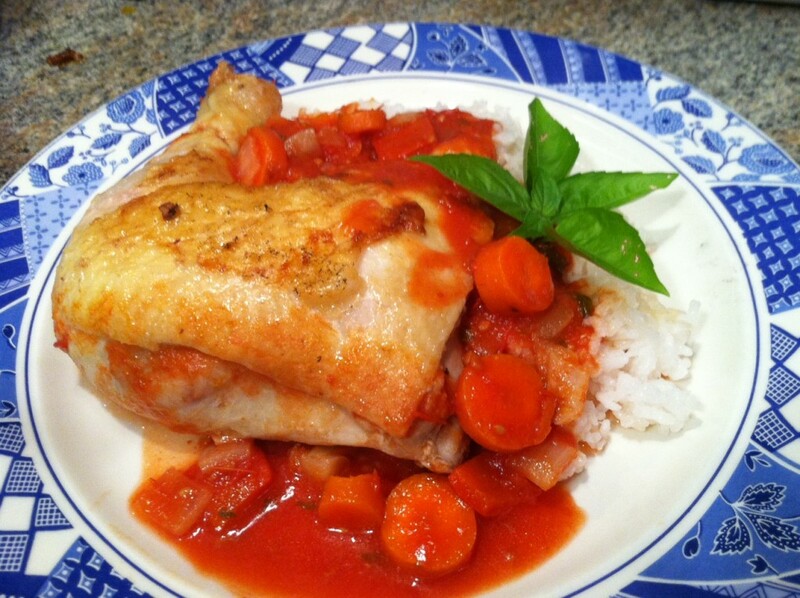 Bake for 30-35 minutes, until chicken is fully cooked. Peanut butter is a great source of health protein, as long as you don’t go overboard the fat content isn’t a deal-breaker. It is also a very cheap staple to keep in the kitchen. But even the most devoted lover of peanut butter sandwiches can get bored of them in time. 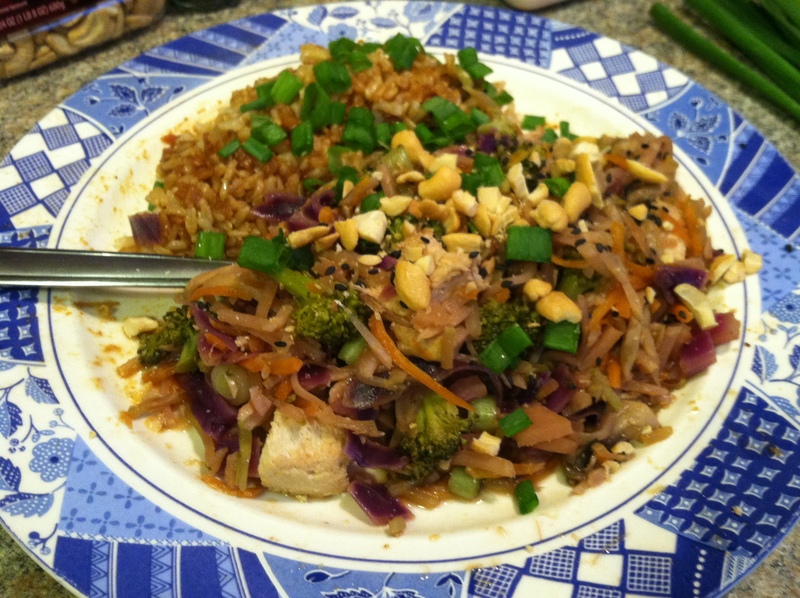 A simple peanut sauce goes great with chicken (or pork!) 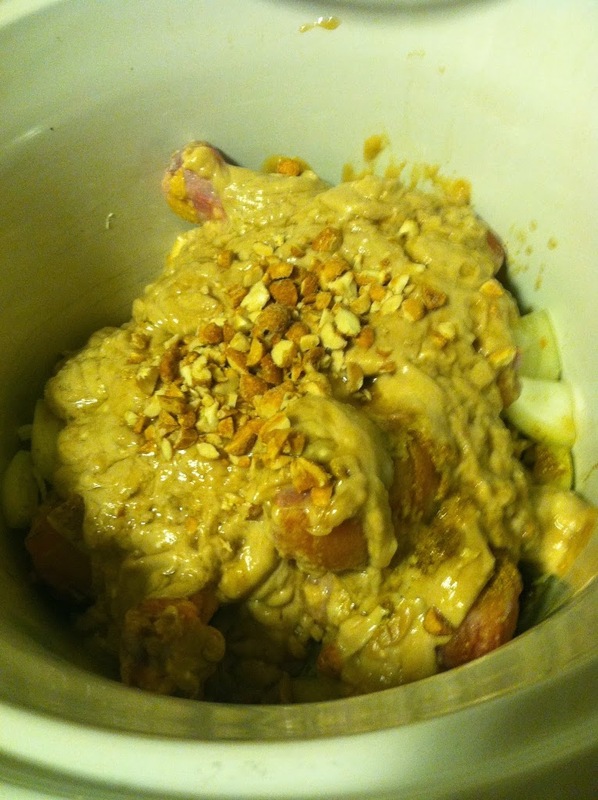 and when made in the slow cooker, it is a breeze to whip up something exotic in no time at all with basic staples. 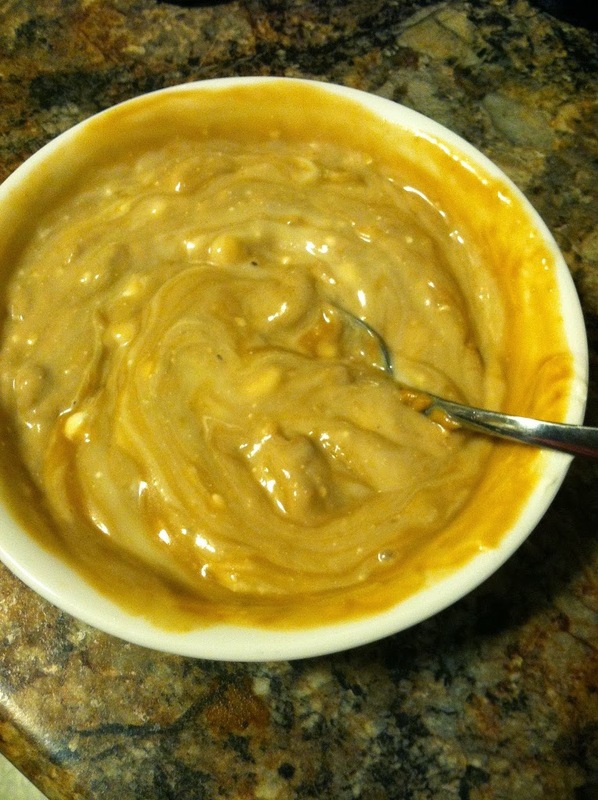 This sauce is a complex mixture of creamy, salty, spicy, and peanuts. 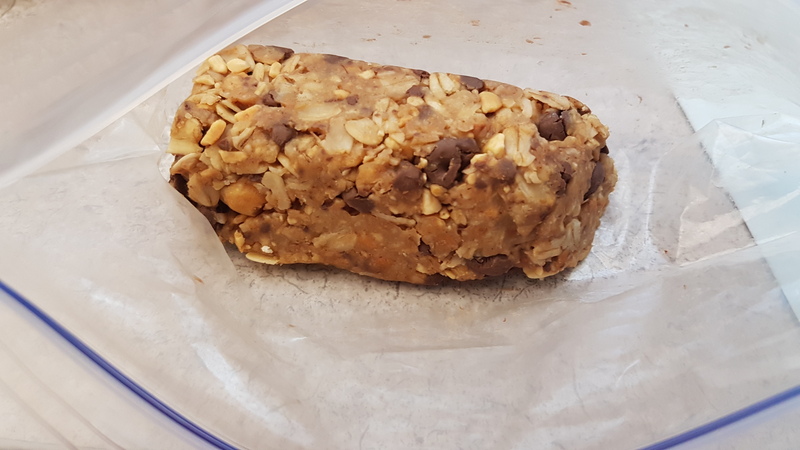 Obviously do not make it or eat it around people who have a severe peanut allergy, as it contains both peanuts and peanut butter. You can control the level of spice by choosing what kinds of pepper to add, if any. Feel free to tweak the seasonings to your preferences. Step 1: Mix all wet ingredients in a bowl. Step 2: Add chicken and all of the spices. You could either mix this in an oven-safe container and bake at 350 degrees for 2 hours, or mix in a crock pot and bake on low for 5-6 hours. 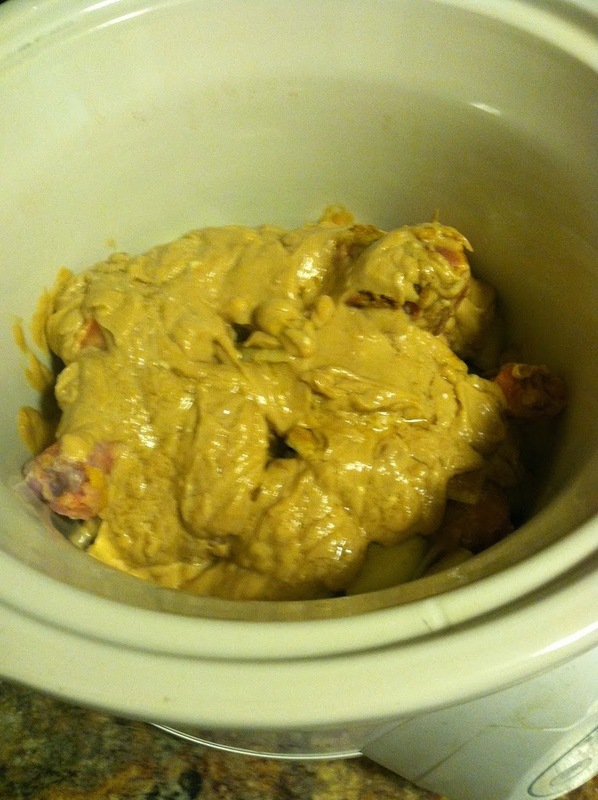 And here you have the chicken and sauce in a crock pot. The crushed peanuts are added on top, then cooked on low. The peanut sauce thickens over time, and is delicious served over pasta or rice. Ask any gardener, and they will tell you that by mid-to-late summer zucchini plants are going bananas, and you can’t give the stuff away fast enough! This is an awesome time of year, when zucchini can be had cheaply at the super markets and farmers markets (or maybe your neighbor, just ask nicely). 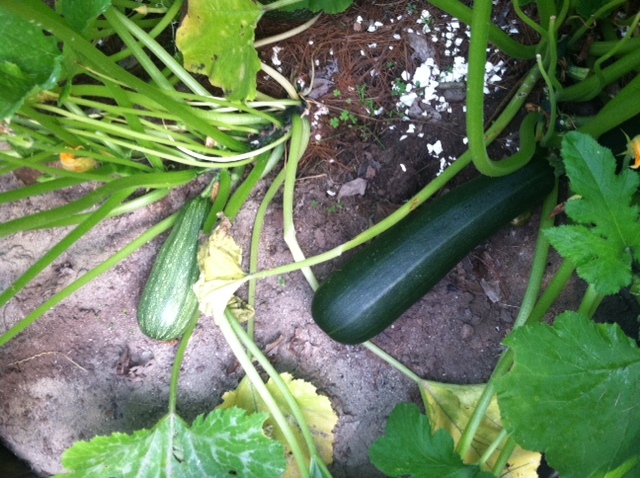 Be prepared, there may be lots of zucchini recipes in the near future, especially since I planted 8 plants this year! Here’s an article with a dozen recipe ideas, I’m sure at least a few will find their way to my test kitchen in the upcoming months. 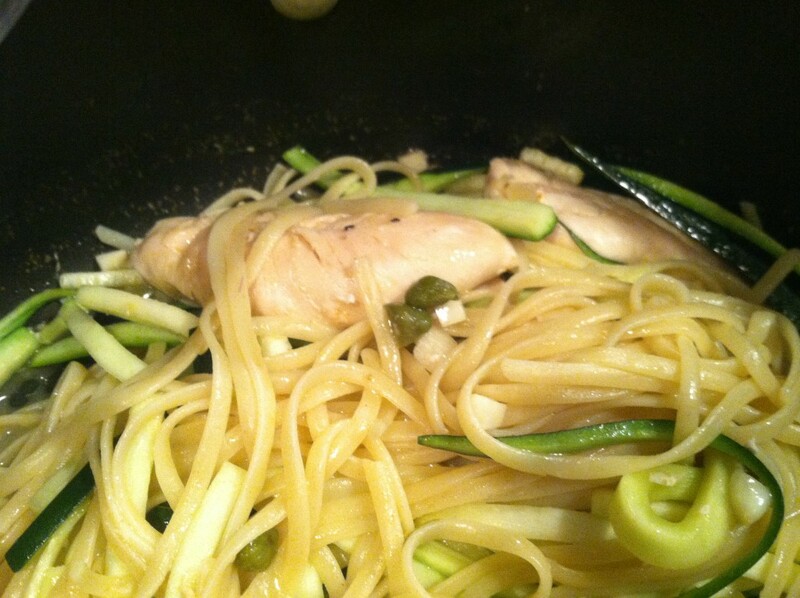 This recipe was my first experience with the new food craze of “zoodles”, the cute name for noodles made from zucchini. 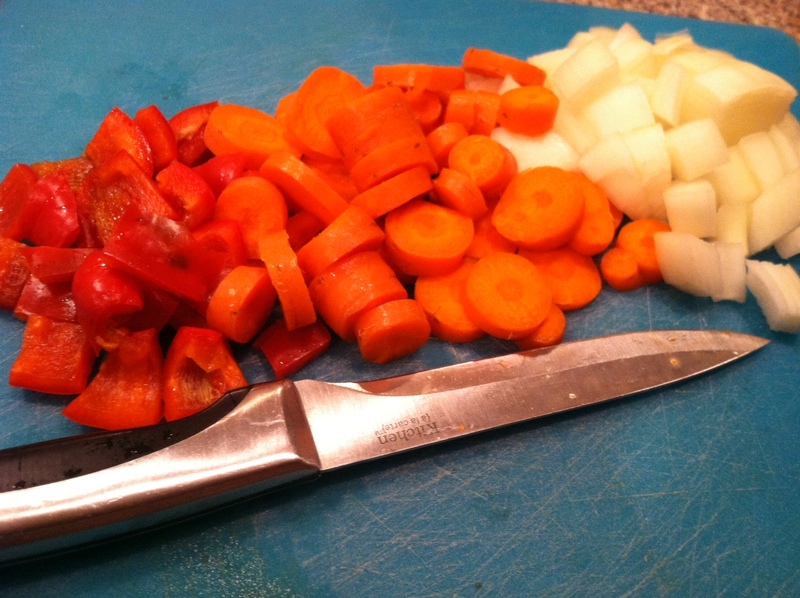 You can try to hand-julienne them, but a mandoline slicer makes the job far easier. 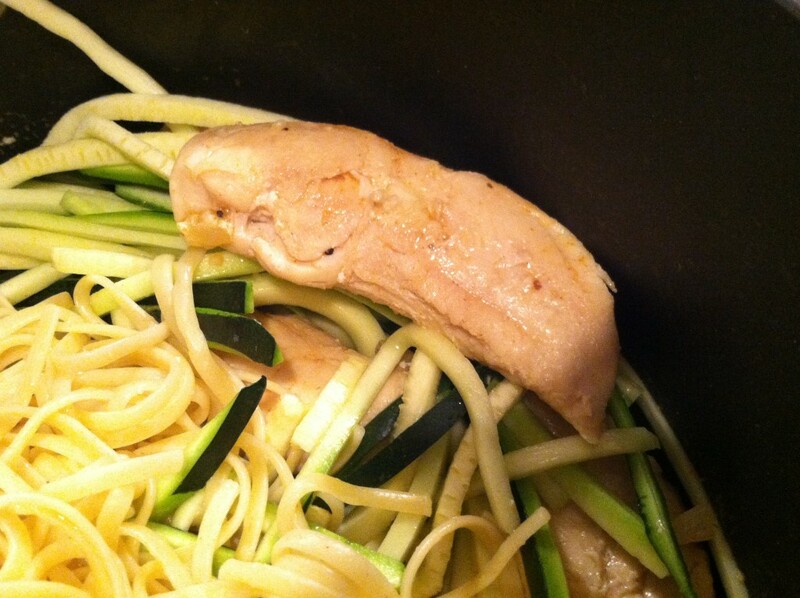 Bascially, the whole zucchini gets shredded into thin noodle-like strands and cooked, then treated like pasta. But way healthier! You’ll get loads of vitamins, plus fiber. 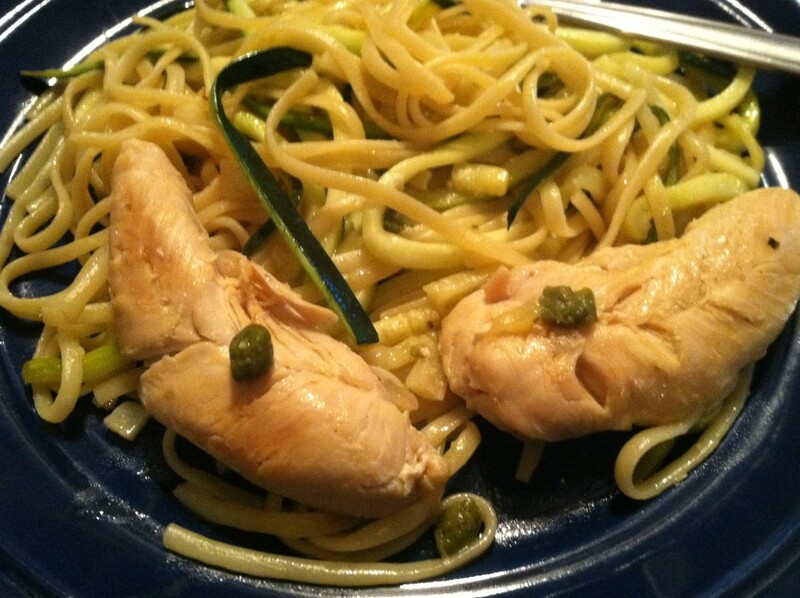 This chicken piccata recipe makes enough for 4. You could easily cut this in half, or double it and freeze some, depending on your mood. I mixed half regular pasta and half zoodles for my first taste, but you can feel free to go all-in, or even use spaghetti squash pasta instead. Step 1: In a frying pan, heat up 1 tbsp oil. Dice the garlic into tiny pieces, and cut the ends off the zucchini. Add the garlic and chicken to the oil, and cover the pan. Cook on medium heat for 7-10 minutes, then flip and cook another 4-5 minutes, or until chicken is no longer pink at all. Step 2: Boil your pasta noodles 8-10 minutes. 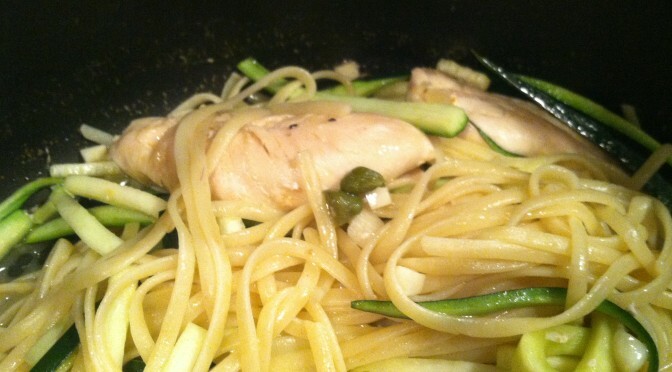 While pasta is boiling, take out the mandoline and slice the zucchini into thin strands*. Add the zoodles in the last 2-3 minutes of cooking with the pasta. Step 3: Drain the pasta and zoodles. Add to the pan with the chicken, and pour in the oil, lemon juice, and capers. Cover, and steam cook 5-7 minutes. Once everything is heated through, place on plate, season to your liking, and serve! This is a double-portion, because my fiancee eats like a racehorse who just finished the Triple Crown. 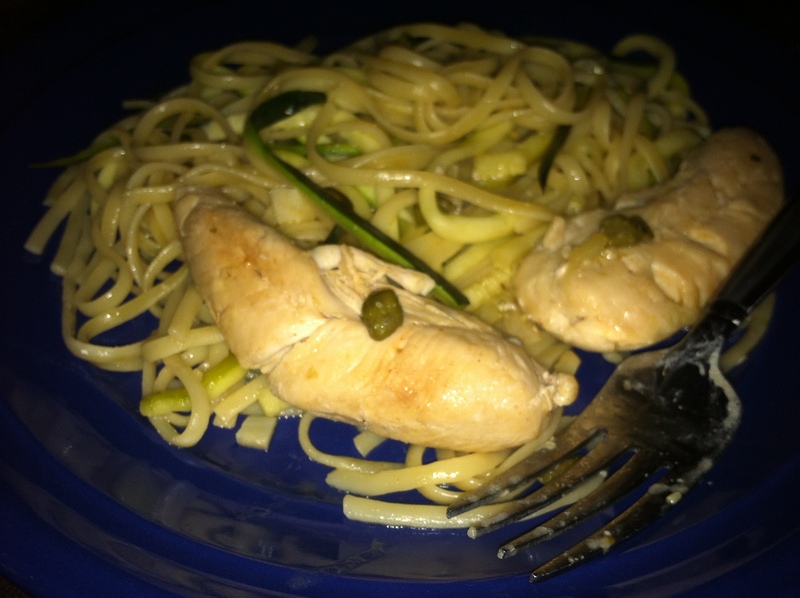 The capers and lemon juice give this dish a nice tangy flavor, while the zoodles add a mellow vegetal taste. 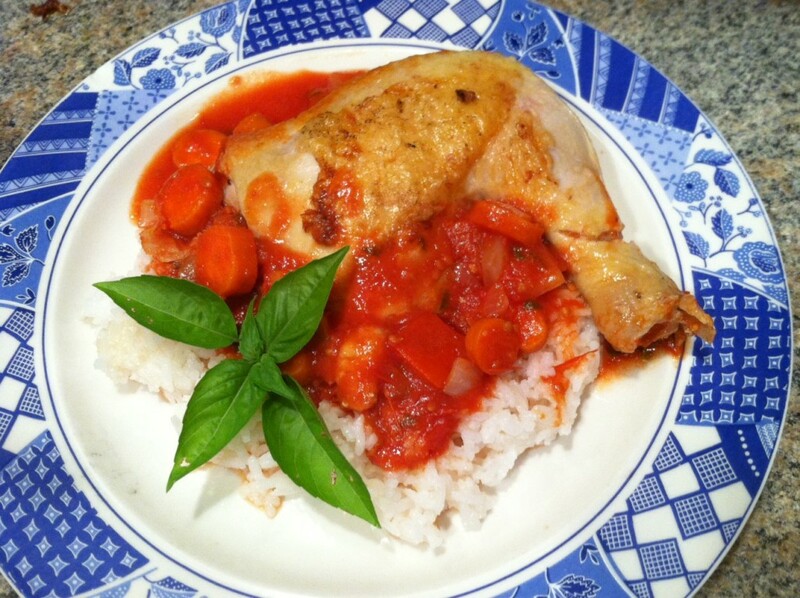 You could also use shrimp here, or broil or boil the chicken instead of pan-frying. Go forth and get your servings of sneaky veggies! 1. Set your mandoline to the thinnest setting. This will make long thin sheets. Add the comb to slice into noodles. 2. 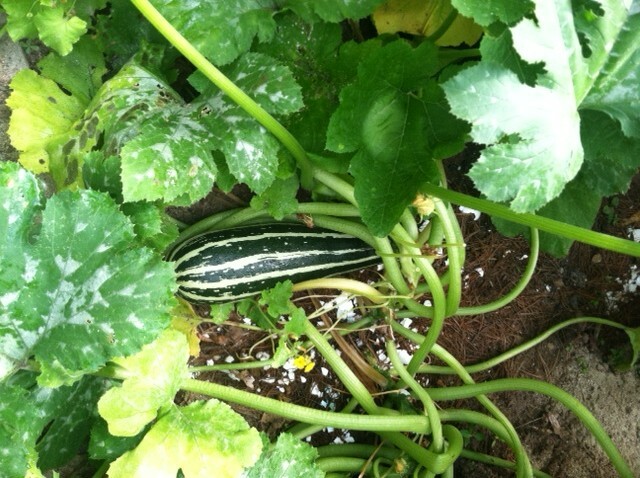 Place the zucchini flat on the mandoline top-to-bottom (lengthwise) and push down the mandoline face. This will cut the first layer. 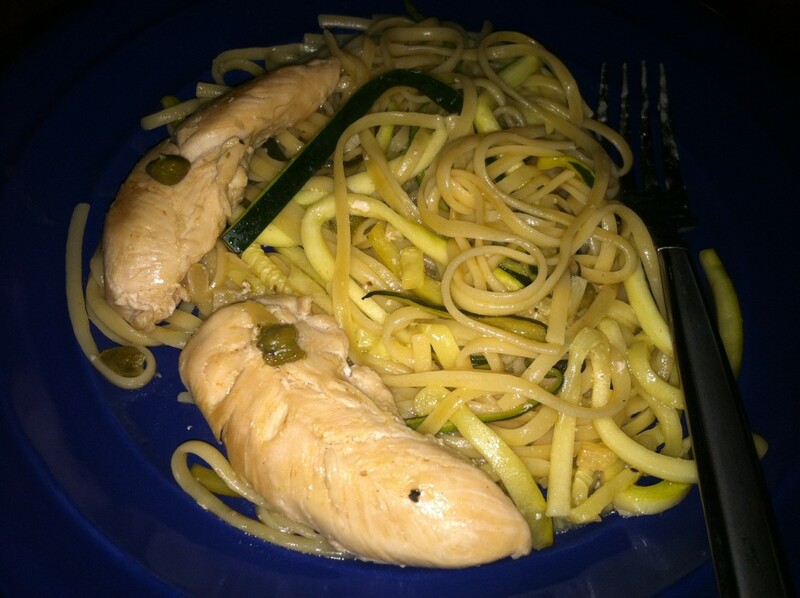 Move the zoodles from underneath the mandoline to a plate. 3. Put the zucchini back to the top of the mandoline, now flat side down, and push down again. Continue until you have a very thin layer left. Hand-slice this layer, or be very very careful to not slice off your thumb!